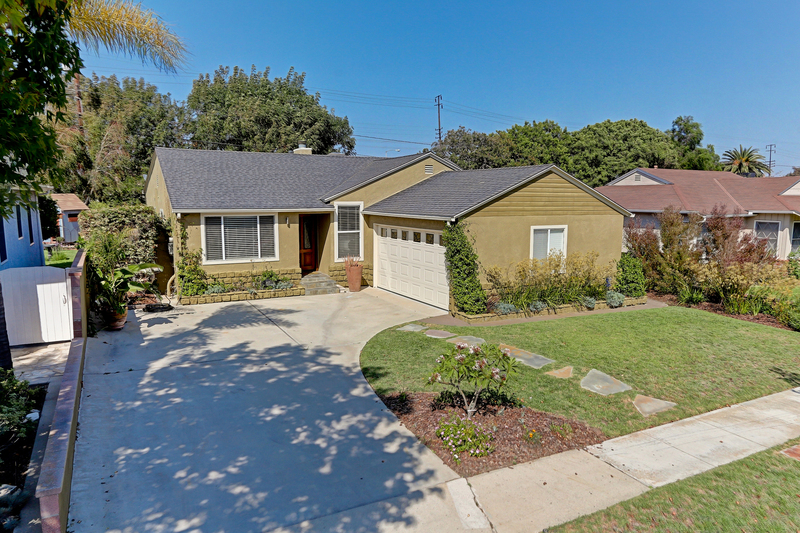 This beautiful home has been nicely updated and impeccably maintained. With 3 large bedrooms (all with walk-in closets), 3 baths and 1,988 square feet of living space on a 7,168 square foot lot. Chef's kitchen with Jenn-air appliances, solid maple cabinets, granite counters and Island - opens up to the great room with bamboo floors, recessed lighting and French doors, Formal living room with see-through fireplace and sliding doors out to the deck and backyard. Huge master suite with "his and her" closets and recessed lighting. Master bath with spa tub, separate shower and dual sinks. 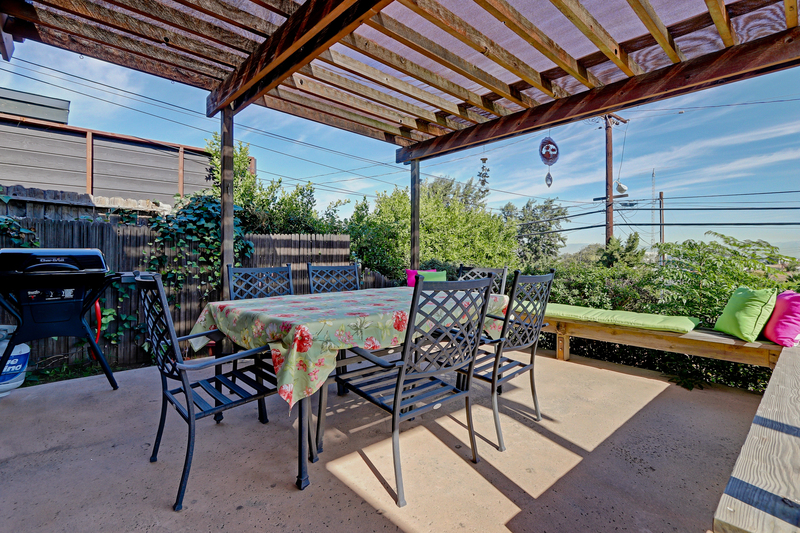 Private peaceful backyard with deck for entertaining. Award winning Torrance schools, Riviera Elementary, Richardson Middle and South High. 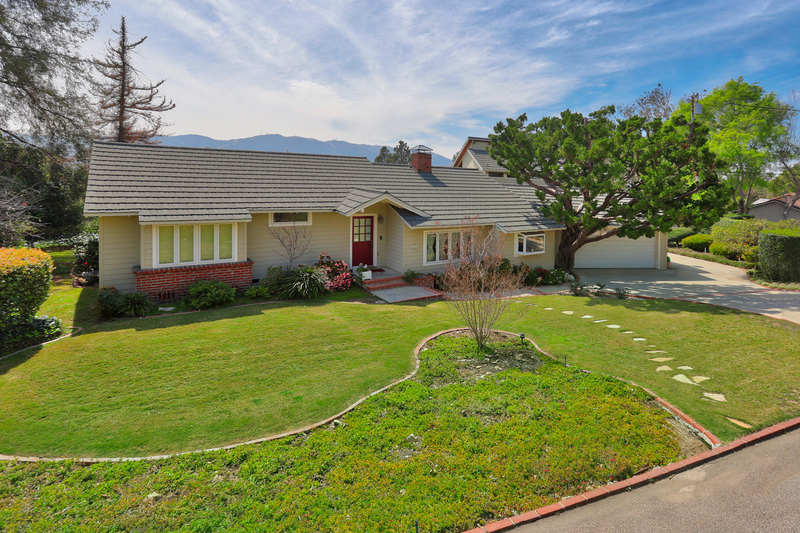 Stunning view home just listed in La Crescenta. What a special opportunity to make this home your own. With 3 bedrooms and 2.5 baths this home has something for everyone. 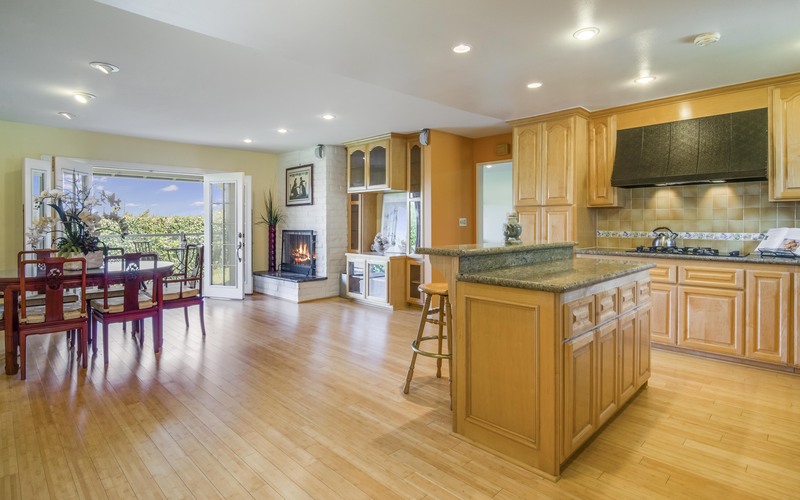 Spacious kitchen opens up to a nice dining room with see through fireplace to the formal living room. Huge art studio with 1/2 bath and balcony with amazing views. Separate laundry room, newer lifetime roof , forced air heat , 4 car attached garage with direct access and basement. 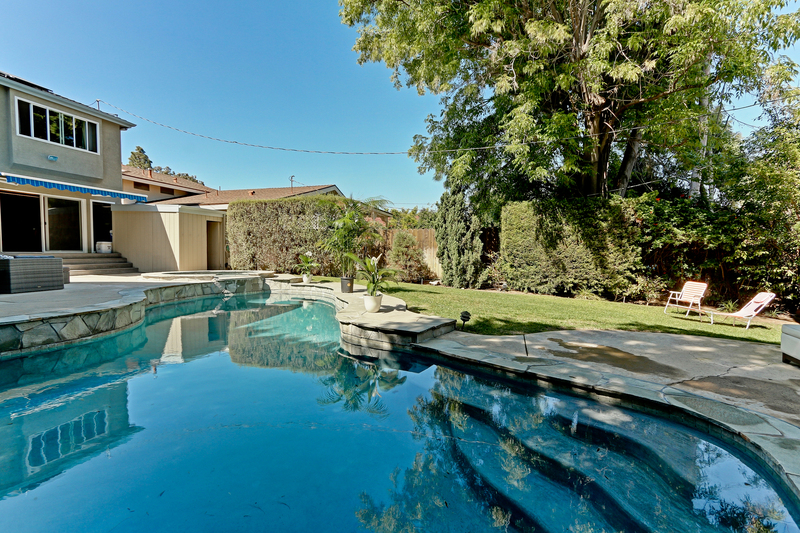 With 2,638 square feet of living space on a private 16,505 square foot lot. This home is truly magical. Very seldom does an opportunity like this come up. 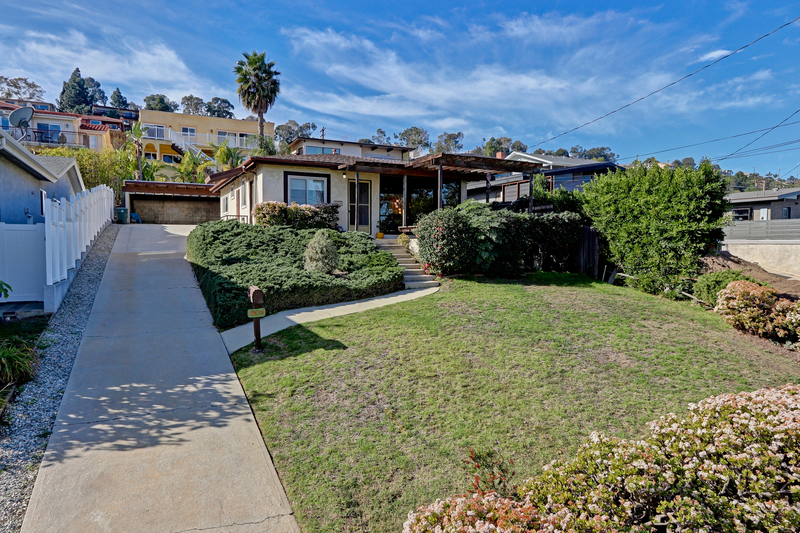 Located in the popular "Golden Hills neighborhood" of north Redondo this is a golden opportunity. 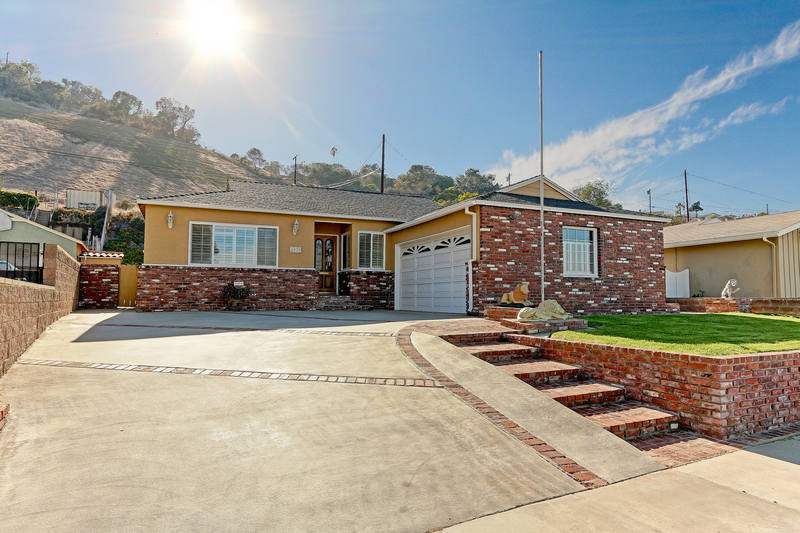 With 3 bedrooms, 2 baths and 1,748 square feet on a 2,489 square foot lot. The living space is on the first floor along with 1 bedroom and a 3/4 bath. 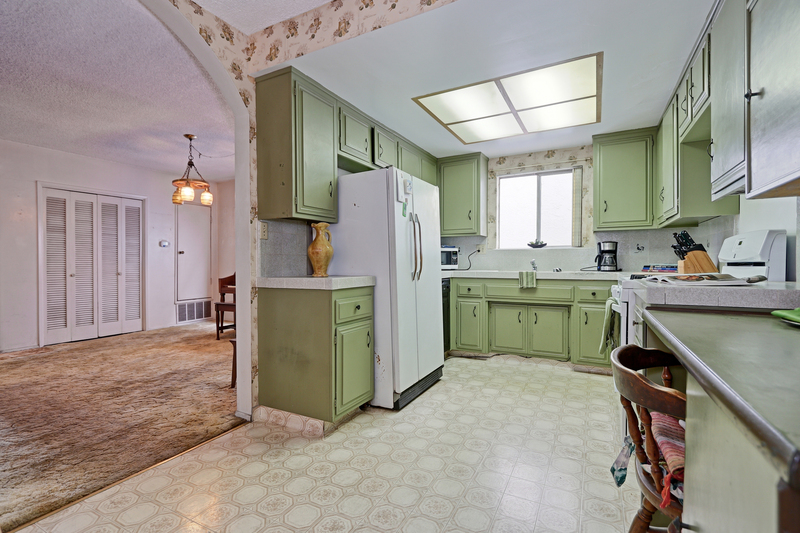 Spacious eat-in kitchen with lots of cupboard space. 2 spacious bedrooms upstairs with large full bath. Newer forced air heater. 2 car garage, small private backyard ( just bring your imagination ) Close to beach, shopping and restaurants with easy access to the freeways. 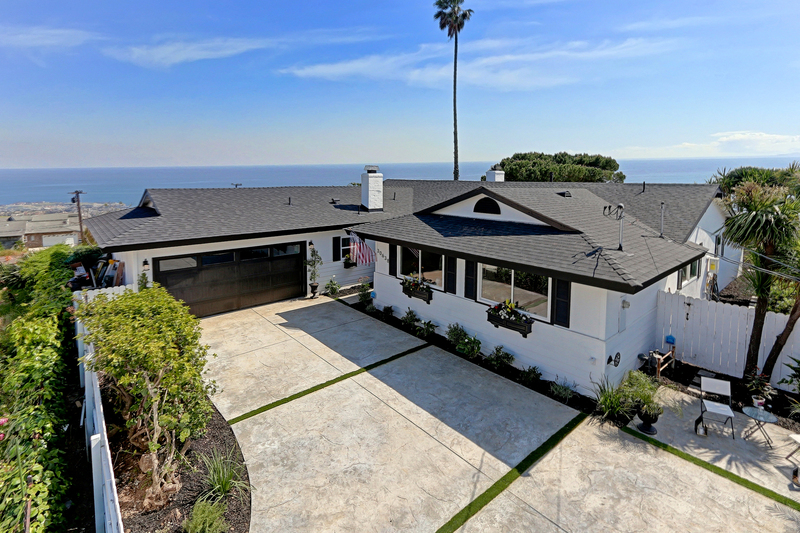 Completely rebuilt in 2007, this is truly a ''One Of A Kind'' with stunning ocean views from most rooms including Catalina, Malibu to Downtown LA from the master suite. 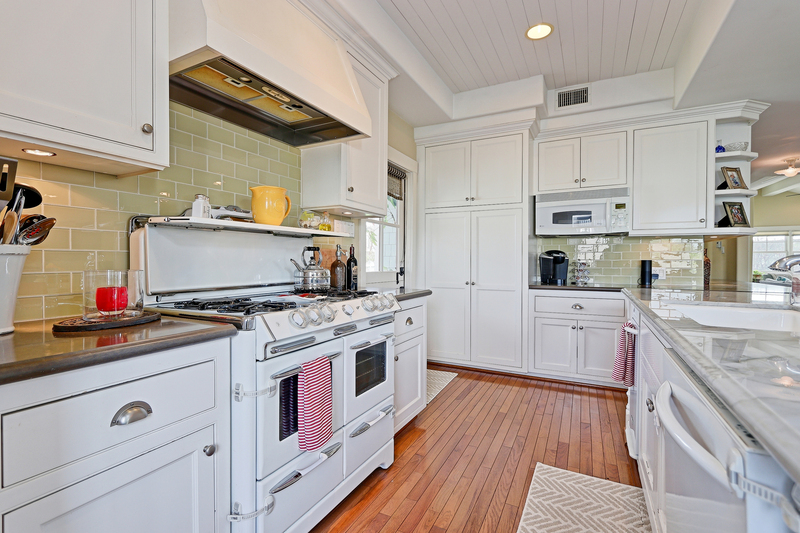 Magnificent vintage style kitchen fully restored 1953 O'Keefe & Merritt stove with double oven and broiler. 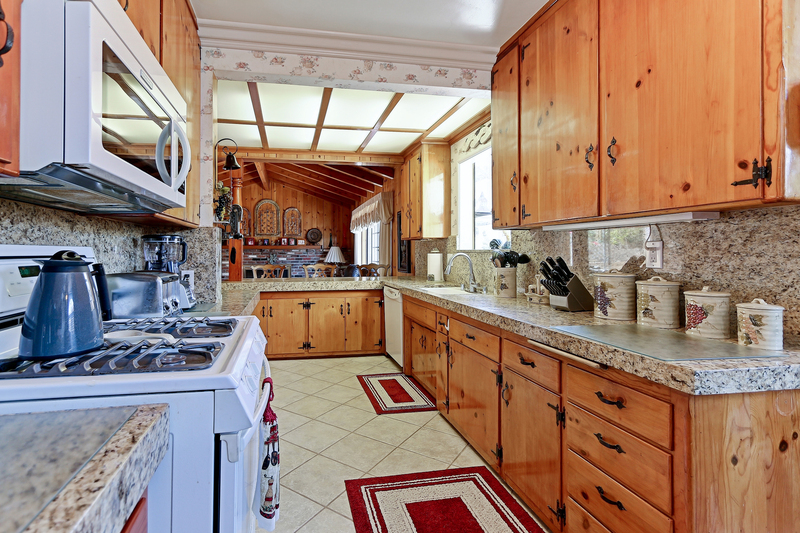 The kitchen opens up to a large great room with stunning hardwood floors. Formal living room with fireplace. Master suite is private and upstairs with 3/4 bath and walk-in closet. 2,236 square feet of living space on a 4,520 lot. 2 good size bedrooms and full bath downstairs. Forced air heating and central AC. Large grassy front and side yard with white picket fence. Nice private bricked backyard with fireplace. Tons of storage in large basement. 2 car attached garage. Hidden treasure on a cu-de-sac street. This end unit is light and bright with 903 square feet of living space 2 bedrooms and 2 baths, master bedroom with walk-in closet and private bath. Kitchen opens to dining area and living room. 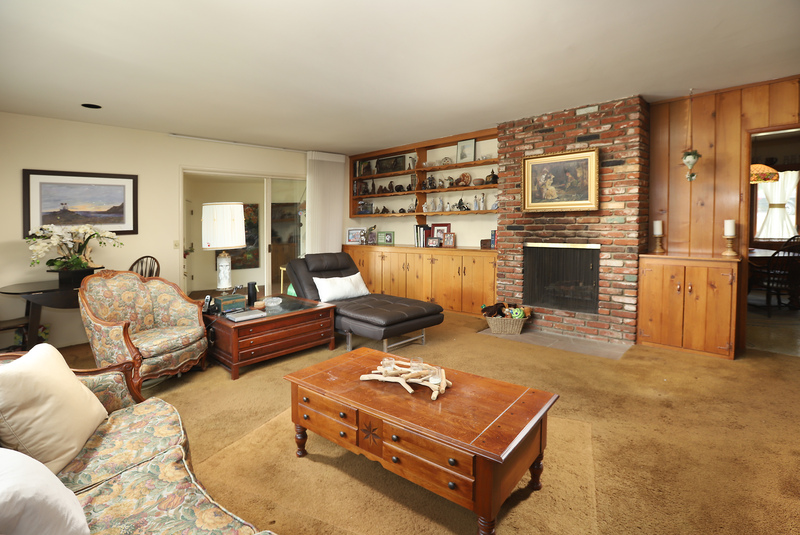 Living room is nice size with a wood burning fireplace and large walk-in closet - perfect for pantry and storage. Interior laundry - washer and dryer included. Nice deck for the bar-b-que. 2 car tandem private parking garage. Small community with low HOA $295 per month. Sparkling pool and spa. Located near a newly developed hiking trail maintained by the city. Newly remodeled. 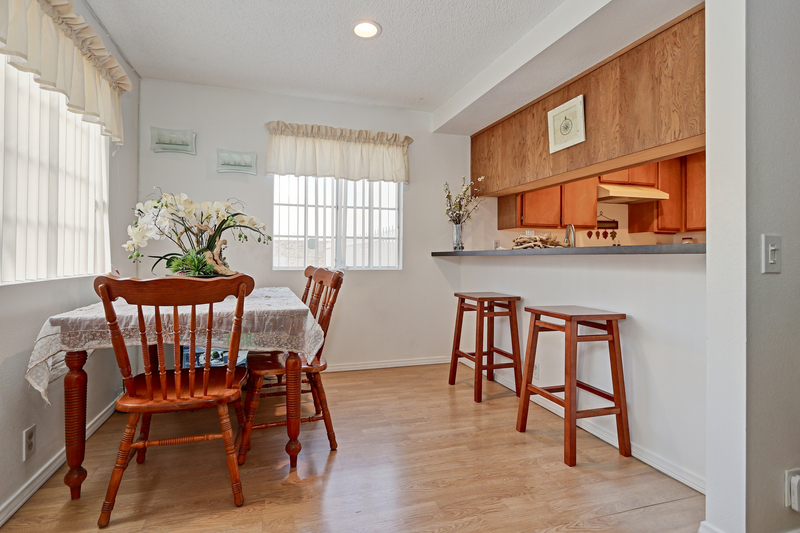 This 2 bedroom, 2 bath townhome is light, bright and cheerful. Kitchen has gleaming white cabinets with soft grey Quartz countertops, tile floor and brand new Whirlpool dishwasher, stove and microwave. Kitchen opens up to the living/dining area with cathedral ceilings and sliding glass door out to the deck. Master bedroom with walk-in closet and master bath with brand new vanity, dual sinks, oversized shower and Quartz countertop. 2nd bedroom is a good size with new ceiling fan and closet doors. Full bath with new vanity and Quartz counter. 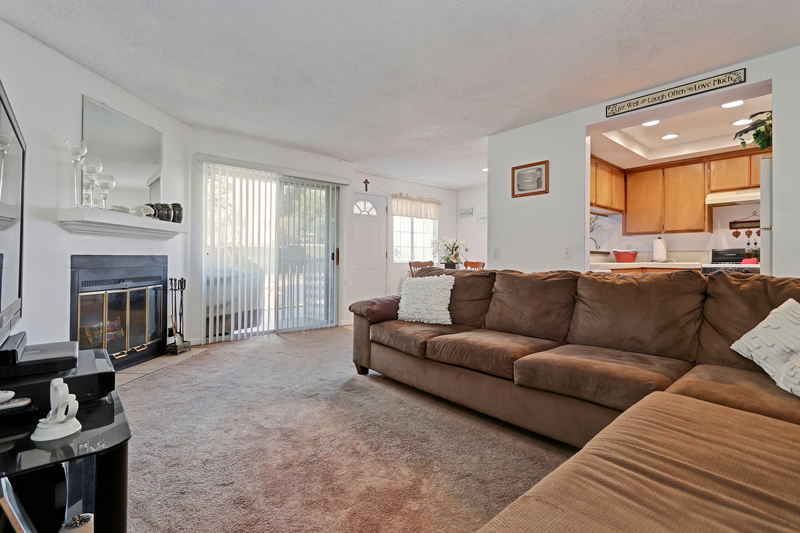 Brand new carpet throughout and interior doors throughout. Newer forced air heater. 2 car garage with direct access, sectional garage door, storage and laundry hook-ups. 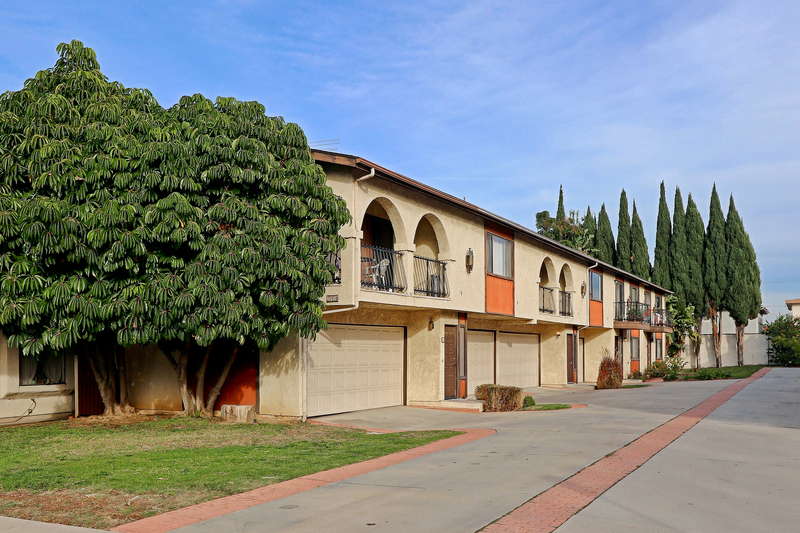 Small 4 unit complex with low HOA's, $220/month. HOA includes insurance, water, trash, gardener and pest control. 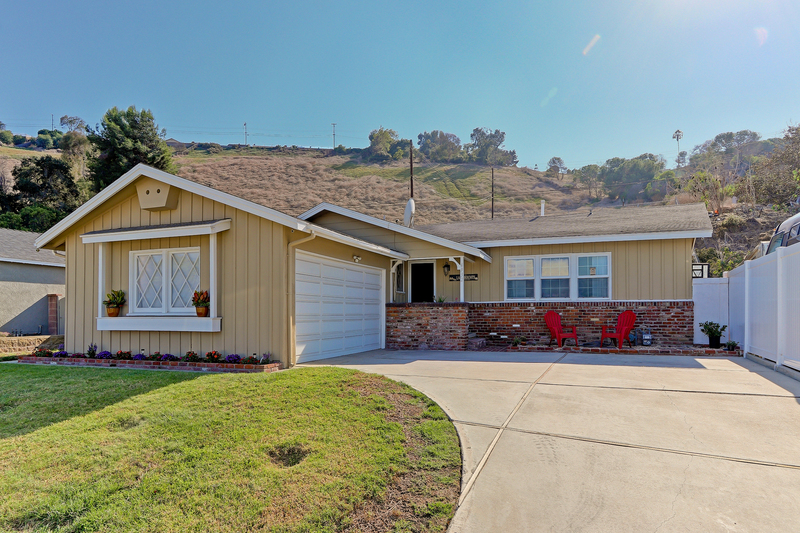 This sweet home has city light and mountain views. With 1,216 square feet of living space and 2 bedrooms and 2 baths. Bonus room is currently being used as a laundry room/office. 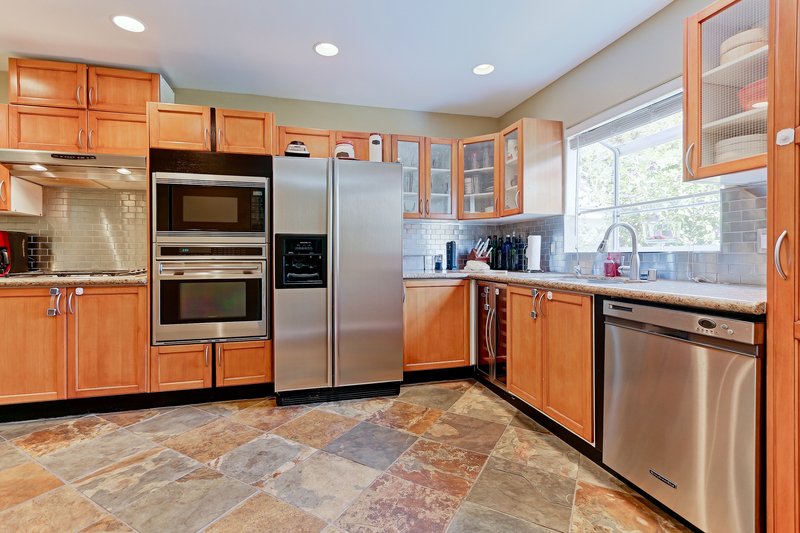 Updated kitchen with granite countertops, laminated floors and custom pull out cabinets with self closers. Large living room with picture window opens up to a front deck perfect for entertaining (table, chairs and bbq included). Lot size is 5,002 sf. 2 car garage with additional covered parking and shed. Award winning Torrance schools, Riviera Elementary, Richardson Middle and South High. 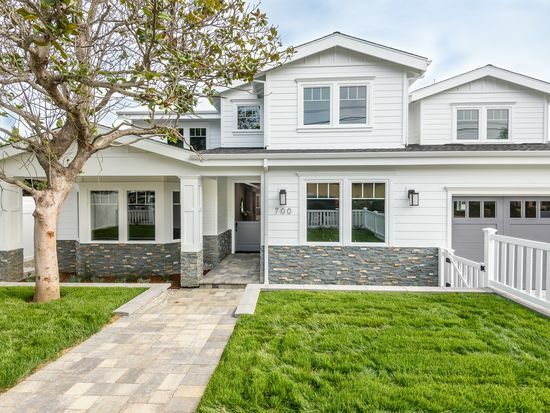 Beautiful, brand new Coastal Craftsman style home in East Manhattan Beach. This exquisite 5 bed, 4.5 baths, 4015 sq. 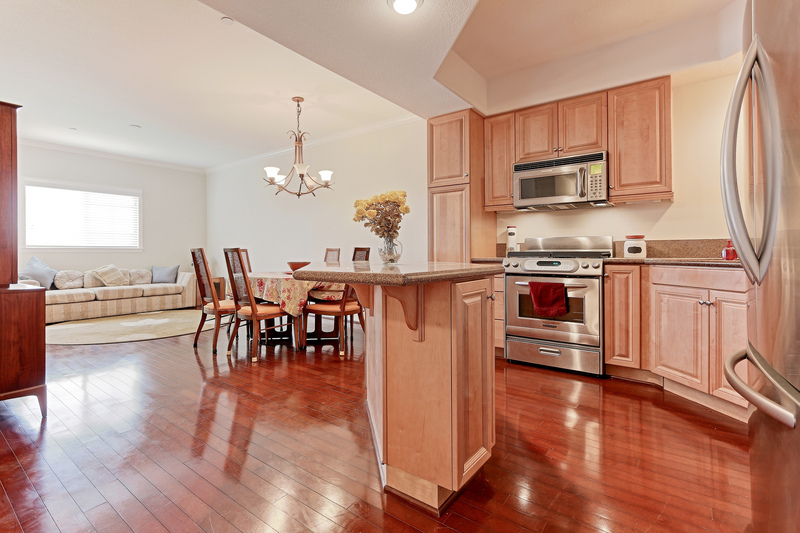 ft. home is perfect for family and entertaining. 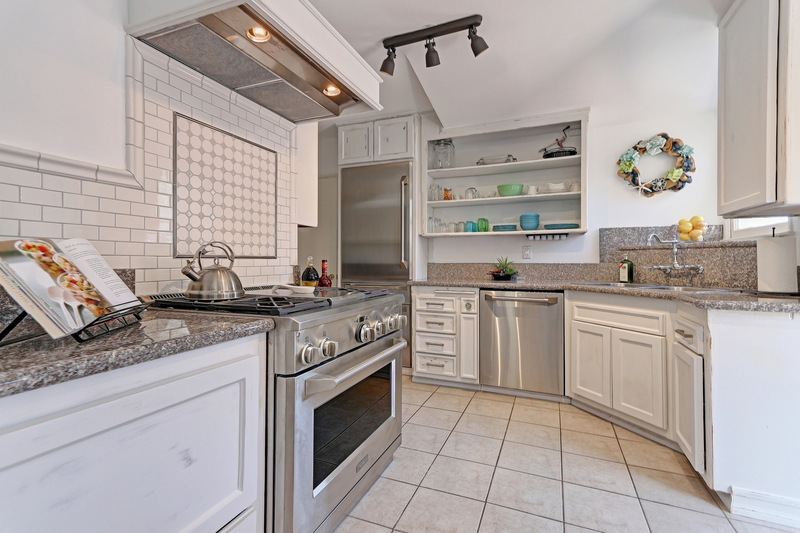 The spacious kitchen with Thermador appliances, quartz countertops, island with seating, and butler's pantry. 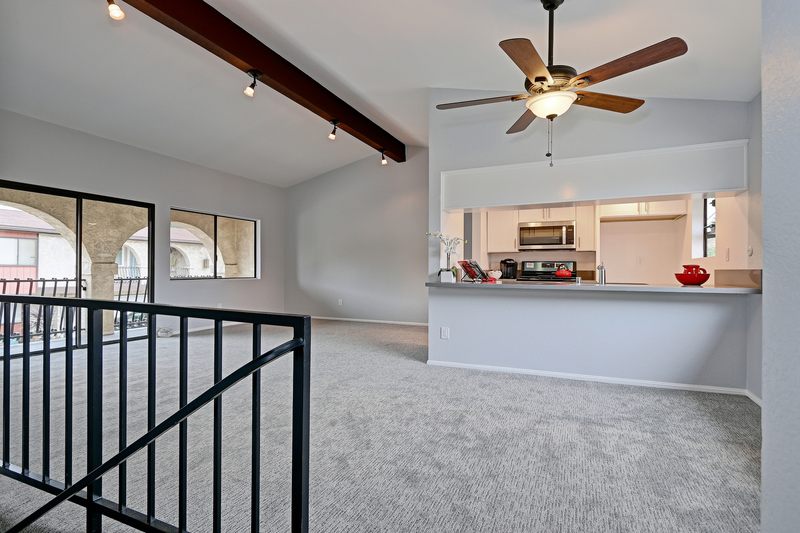 Family room with lift and slide door system allows for a great indoor, outdoor living space. 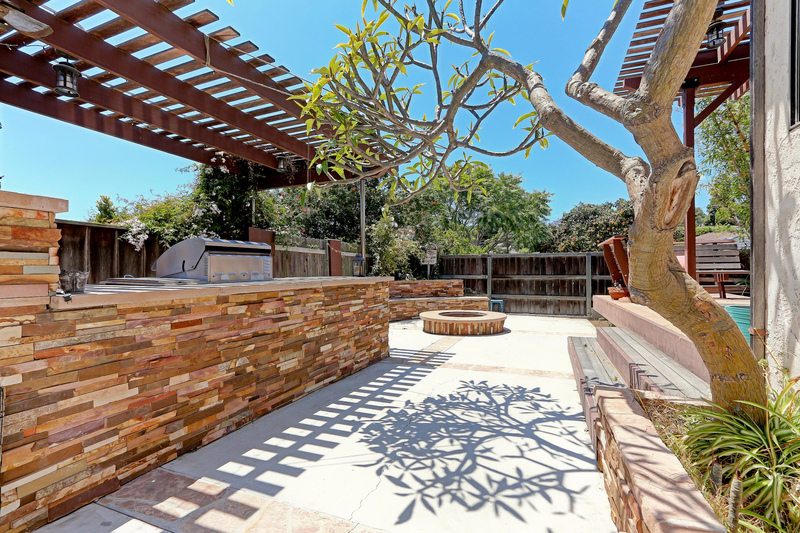 Paved backyard with fire pit. Main floor bedroom / office with private bath, 3 car garage and large storage area. 2nd floor has dedicated laundry room, Master suite with walk in closet, fireplace, large master bath with marble tile, high end fixtures and sit down vanity area. 2 additional bedrooms with jack and jill bathroom, and 4th bedroom with private bath. This home has 2 AC units, 2 water heater, 2 heating units and each floor is on its own Nest system. There is ample storage space throughout the whole home. 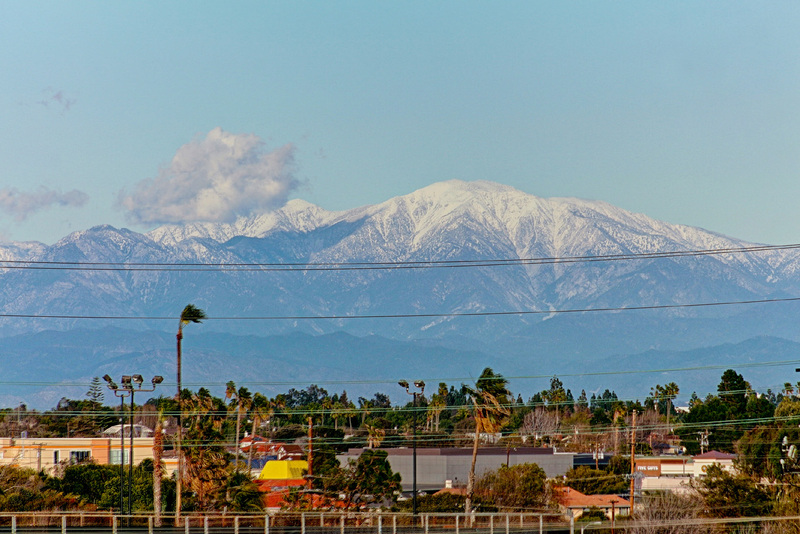 Close to schools, parks, and easy freeway access. 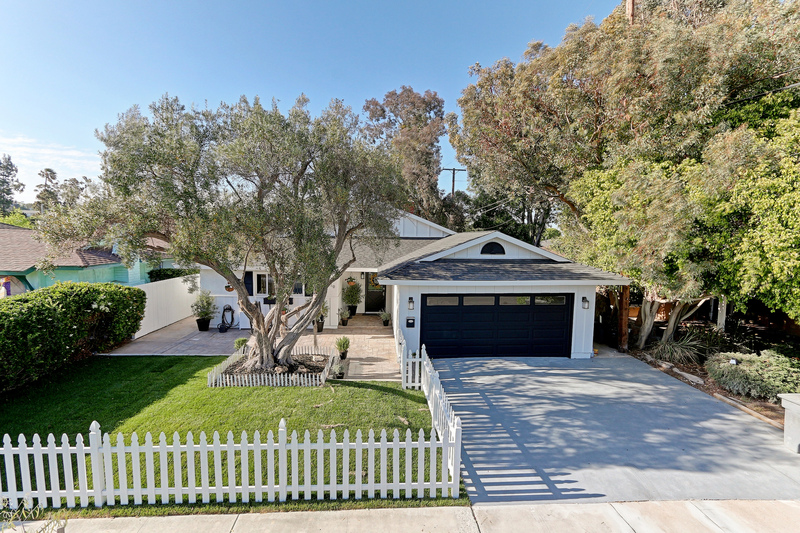 Just listed in the lower Riviera this turnkey home is wonderful for a growing family. With 4.5 baths and 4 bedrooms (3 of which have their own baths) and 1,962 square feet of living space on a 17,690 square foot lot. 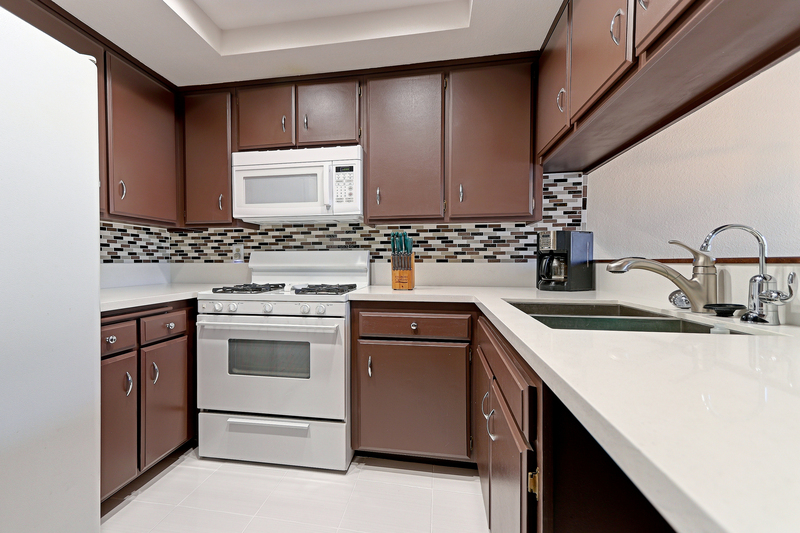 Eat-in kitchen with granite counter tops, custom tile back splash and brand new stainless GE Monogram appliances (refrigerator, dishwasher and professional stove). 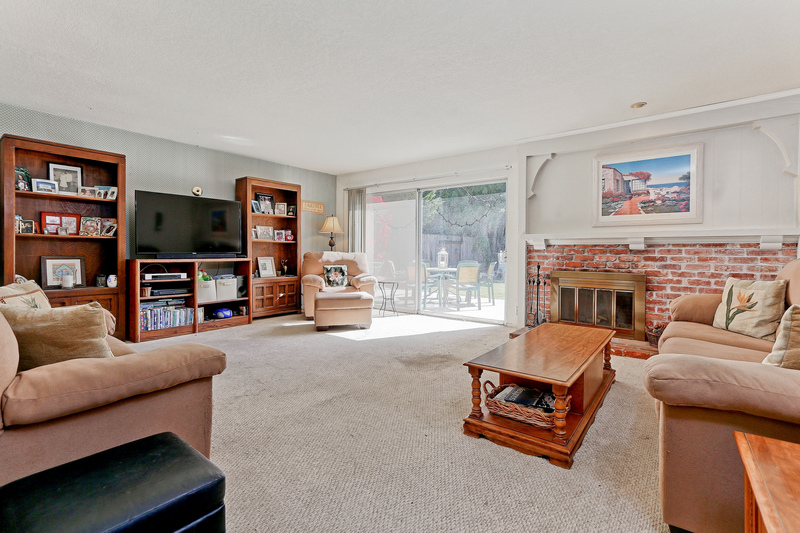 Huge family room with vaulted ceilings opens up to a nice backyard for entertaining. Formal living room/dining room combination with bay window. Forced air heat and copper plumbing. 2 car attached garage with direct access and laundry (washer and dryer included) The lot depth is 259 feet and the upper lot is undeveloped with endless possibilities and city light views. Award winning Torrance schools, Riviera Elementary, Richardson Middle and South High. 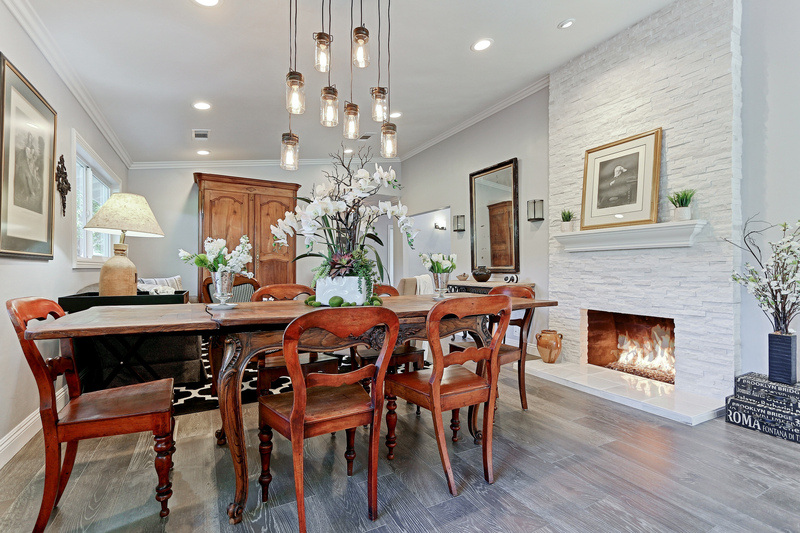 Renovated with the finest materials and detailed craftsmanship with 2 living areas, this Valmonte home shows like a dream. 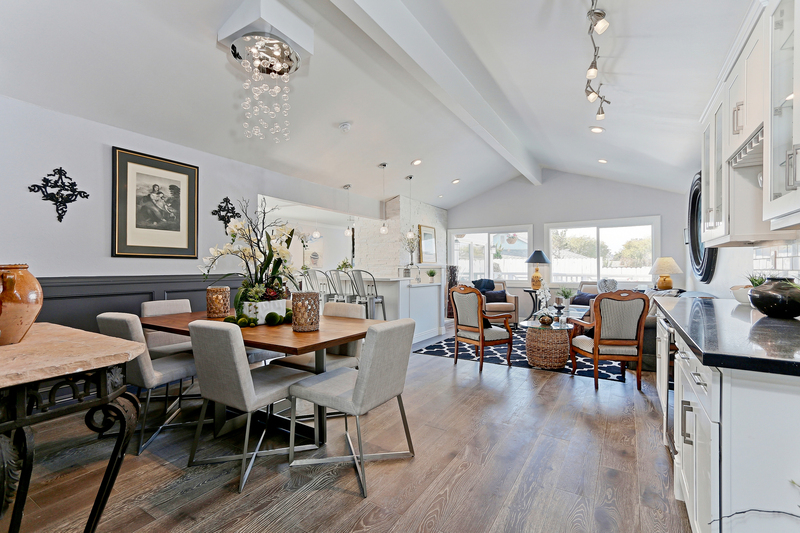 The grand formal living room/dining combination features crown molding, recessed lighting, Dutch door going out to the quaint BBQ area and stunning walnut hardwood floors. 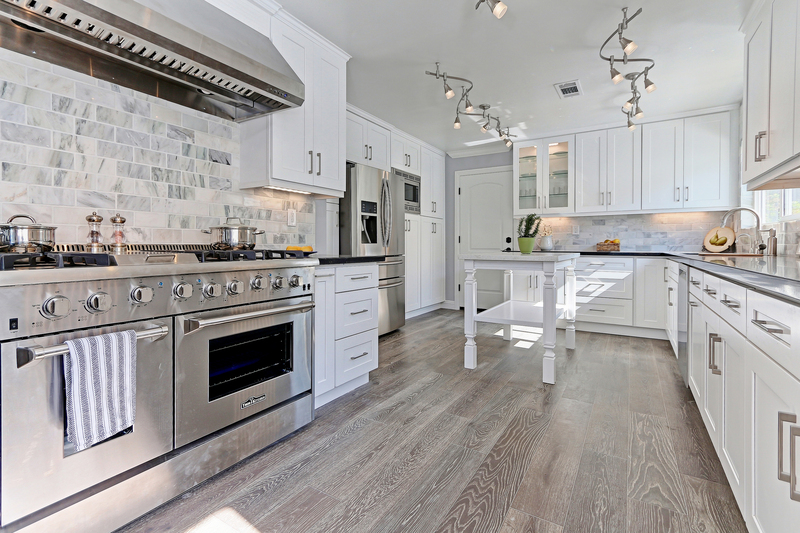 The Chef's French country kitchen is complete with custom cabinets and lighting, Quartz counter tops, island and dual fuel La Cornue professional hand finished stove with 5 burners and 2 ovens. 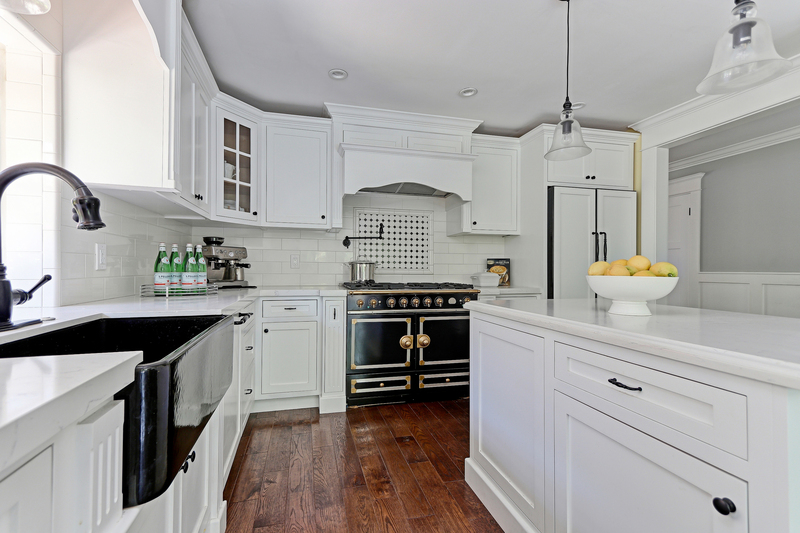 The kitchen blends beautifully into the family room with granite fireplace, wainscoting, crown molding and built-ins. 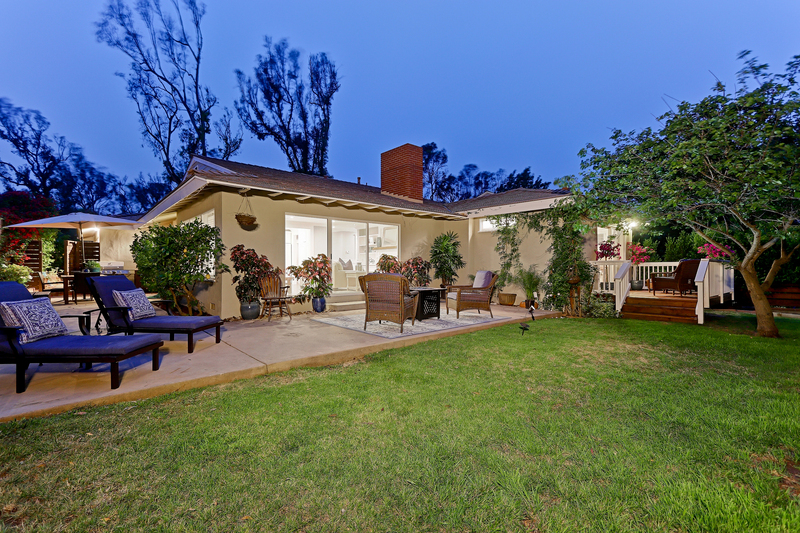 Step outside from the great room to a serene lush landscaped yard for entertaining. Master bedroom with private deck for relaxing and master bath with spa tub. The other 2 baths have been remodeled. The home has 1,815 square feet of living space with 240 square foot bonus room with it's own 3/4 bath. Perfect for an office, workout room or kid's playroom. Close to the beach, golf course, trails and Riviera Village. Hidden Treasure on a quiet Cul-De-Sac. 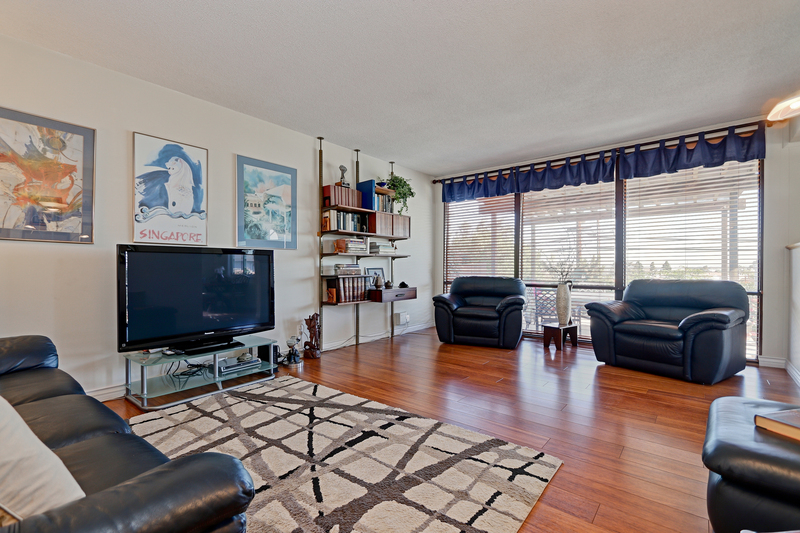 Upgraded 2 bedroom, 2 bath condo with detached 2 car garage. Updated kitchen with quartz counters and custom cabinets that opens up to a cozy family room with hardwood floors and a wood burning fireplace which opens up to a private balcony. Master suite with walk-in closet and new carpet. Both baths have been beautifully remodeled. Brand new air conditioning. Washer, dryer and refrigerator are included. Low HOA with community pool and spa. 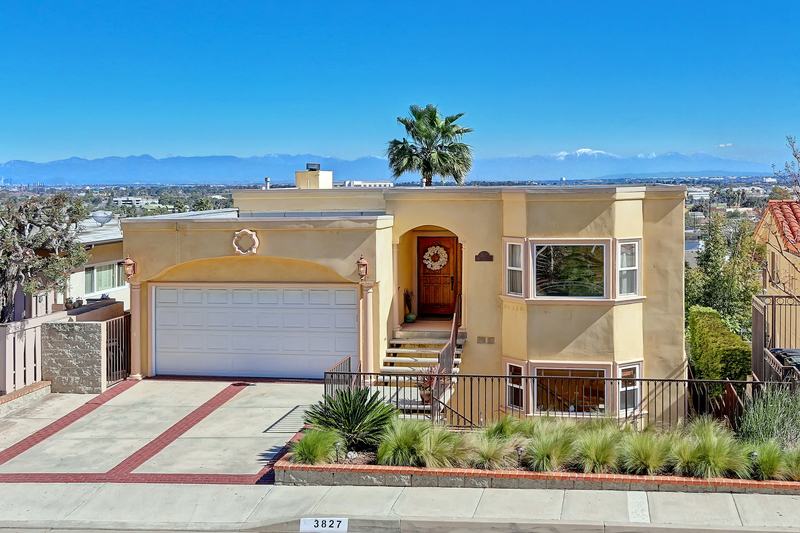 Nestled at the top of a cul-de-sac for the utmost privacy, on a 11,652 square foot lot with spectacular 180+ degree views of the ocean, coastline and Catalina. Wake up to the inspiring sunrise over Huntington Harbor to start your day while a mesmerizing sunset over Terranea will melt it all away. With 4 bedrooms, 3 baths, great room, game room and formal living room this property if perfect for an extended family. This home is state of the art " energy efficient" while having a perfect blend of indoor/outdoor living. The great room is the "heart" of the home incorporating the Chef's gourmet kitchen with both a breakfast nook and formal eating area and family area. The kitchen features a custom 9 foot island, designer cabinets, Quartz countertops, Carrera marble backsplash, professional grade Thor range with 6 burners and double ovens, Bosch dishwasher, 4 drawer refrigerator and built-in desk. Master suite with "his and her" closets. Master bath with dual sinks and sparkling Quartz countertops , marble floors, spa tub and oversized designer shower with dual heads. The den/game room is a wonderful bonus space with a stunning Arctic split granite fireplace, built-in wet bar with wine refrigerator and built-in media cabinet which houses a 60 inch TV. The outside space can be accessed from the great room, living room and master - making the transition easy from inside space to outside space. 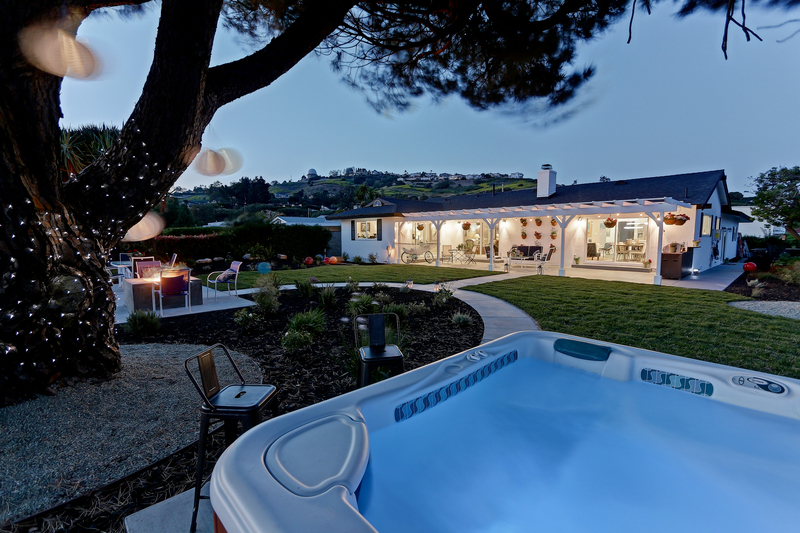 Wrap around views forever - complete with gas firepit, 8 person hot tub, covered Ramada with built-in BBQ station, trio garden area and an impeccable landscaped yard with is drought friendly with a drip system. Other features include a separate laundry room, French oak wood floors, new roof, all new vinyl windows, all new electrical, all new plumbing, LED lighting, new heater and air conditioner, tankless water heater, Dutch door entry and stamped private driveway. This home is perfect for the savviest of buyers. 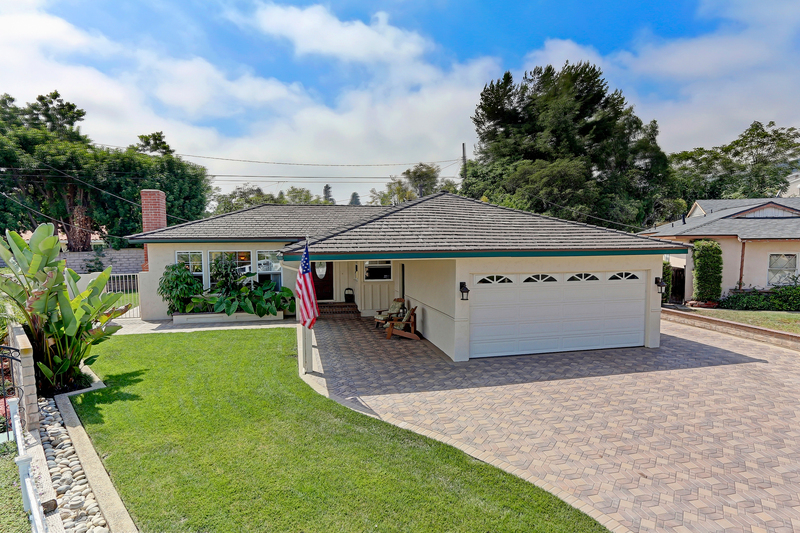 You will truly feel "on top of the world"
Just listed in a quiet South Torrance neighborhood - this wonderful family home features 3 bedrooms, office and 3 baths with 2,326 square feet of living space on a 6,817 square foot lot. 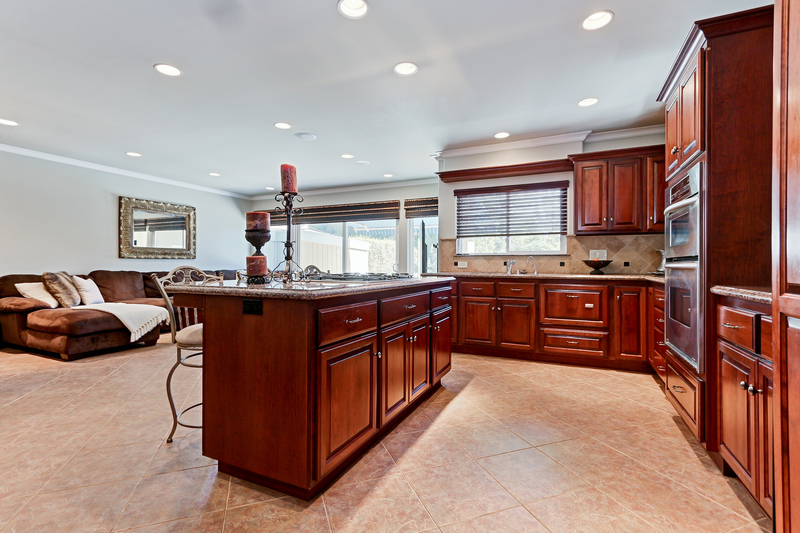 Gourmet chef's kitchen with designer cherry cabinets, granite countertops and Island. Spacious great room with tile floors and recessed lighting opens up to the resort style backyard complete with a salt water pool, spa and waterfall. Formal living room with hardwood floors, bay window and brick fireplace. The downstairs level features 1 bedroom with hardwood floors with an attached updated full bath, the office, laundry area and updated 3/4 bath with an step-in shower. Upstairs in the 2nd bedroom and master suite with walk-in closet. 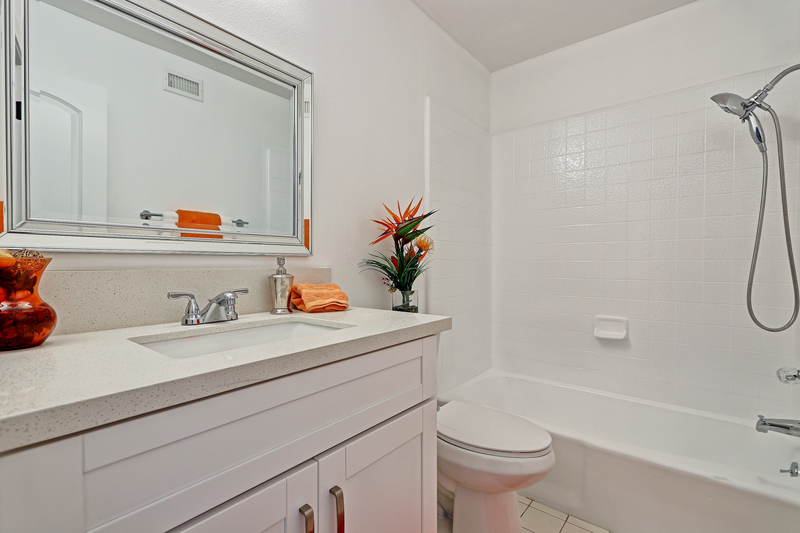 Master bath has been beautifully remodeled with tile and oversized shower. Detached 2 car garage with pull down storage. 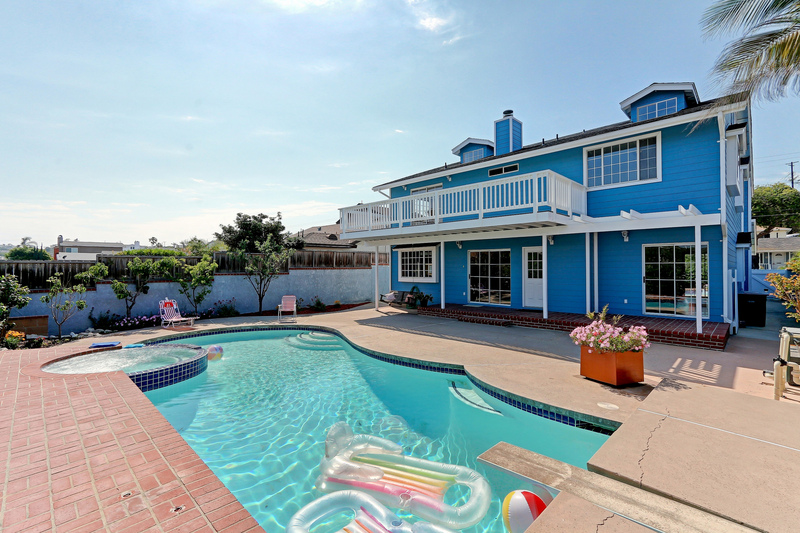 This home is a "one of a kind" and the perfect home to enjoy Southern California living. Award winning Torrance schools, Walteria Elementary, Richardson Middle and South High. 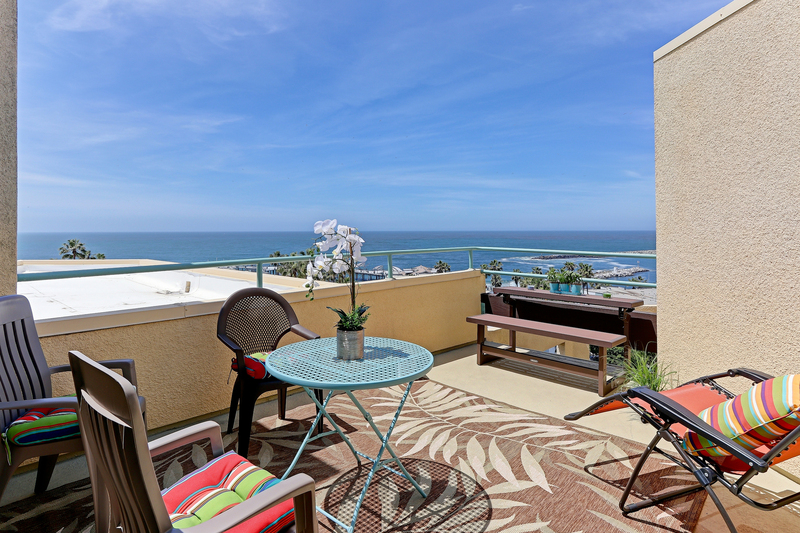 Rare oceanfront penthouse with breathtaking panoramic coastline, ocean, harbor and sunset views. This home features 2048 square feet of living space with 2 bedrooms, 2 baths and a spacious loft that could be used for a 3rd bedroom or an office. 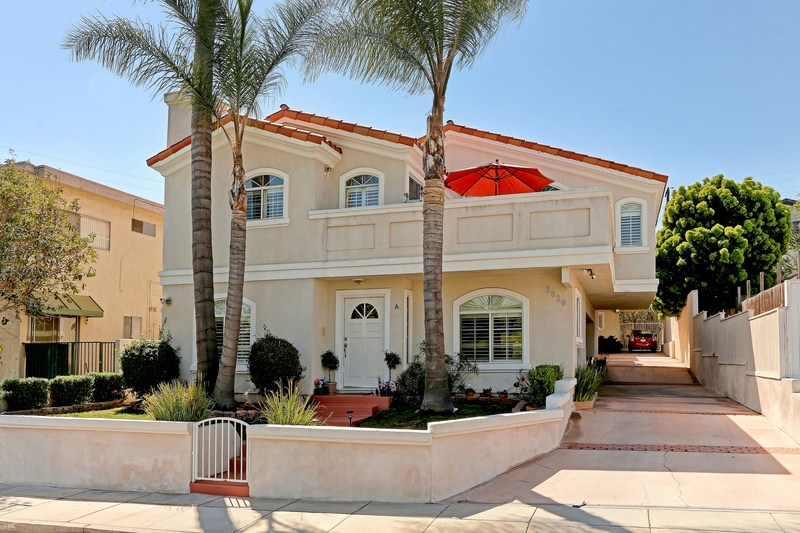 With 2 story high ceilings and huge picture windows this home is drenched with natural light. Galley style kitchen with pantry and breakfast nook opens up to a generous dining area/ living room combination with wood burning fireplace and a deck for entertaining accessible from both the living room and master suite. Master suite with walk-in closet and nicely updated bath with separate shower and tub. The second bath has been nicely updated as well. 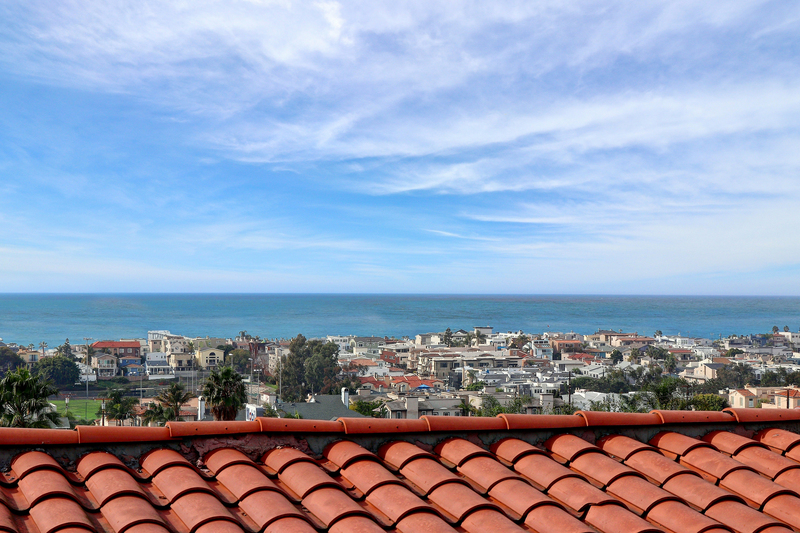 The loft has a big storage closet and wet bar and opens up to a huge private roof top deck for enjoying the sunset over the pacific ocean. Seascape III is a resort style complex with pool, spa and lush landscaping. With elevators and 2 dedicated side by side parking spots. 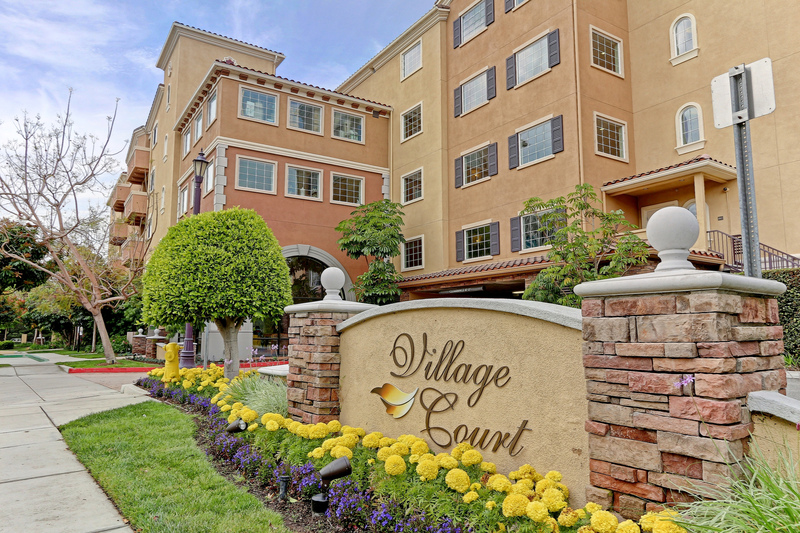 This complex offers a relaxed healthy lifestyle with a short stroll to the bike path, harbor and restaurants. With 3 levels of expansive living space and indoor/outdoor entertaining opportunities, this executive style home features 4 bedrooms and 2.5 baths with 3,414 square feet on a 5,393 square foot lot. Upon entering, you will be greeted to a generous sun drench living room that flows into a formal dining room with built-in buffet. Huge chef's kitchen with oversize island, built-ins, 6 burner Thermador professional stove with custom hood and Bosch dishwasher. The kitchen opens up to a fabulous family room with rock fireplace and built-in bookshelves. From both the family room and kitchen, you have access to a newly resurfaced deck with magnificent city and city light views. Brand new gleaming flooring through-out the entry, kitchen and family room. The second level features a spacious master suite with walk-in closet, master bath with separate shower, spa tub and Quartz countertop with dual sinks and new fixtures. The other 3 bedrooms are huge - 2 with walk-in closets. All bedrooms have entrances to the outside and fresh paint. Second bath with oversize shower and sparkling Quartz countertop. Separate laundry room. 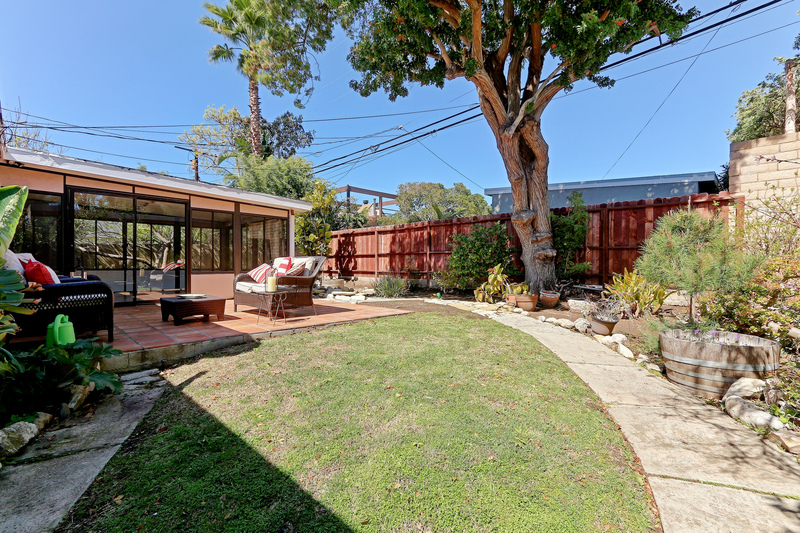 On the lower level you will find a tranquil lush backyard for relaxing. Enormous covered outdoor area - just perfect for family fun activities. There is also a "Man Cave" - that perfect area for privacy. Other features include - new dual zoned air conditioning, newer roof, copper plumbing, new vinyl windows and a 2 car attached garage with direct access. Award winning Torrance schools, Riviera Elementary, Richardson Middle and South High. Why pay rent when you can own this great condo. 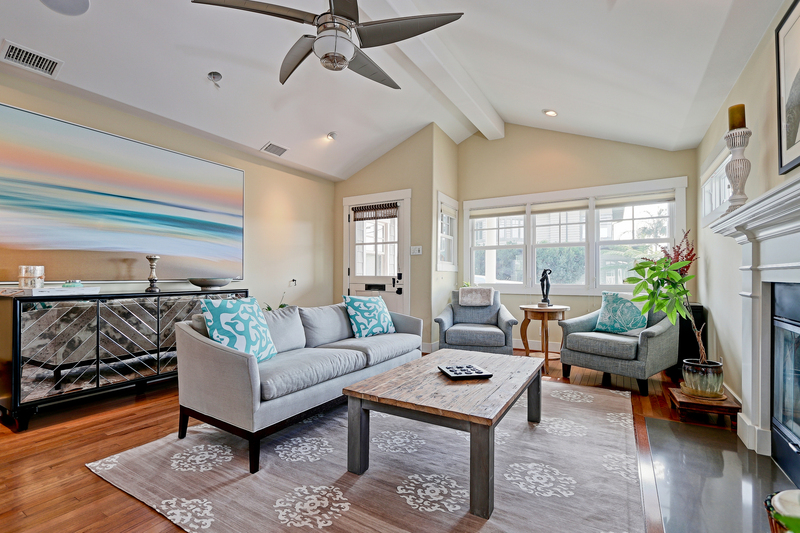 This home is the perfect blend of urban excitement and coastal relaxation. 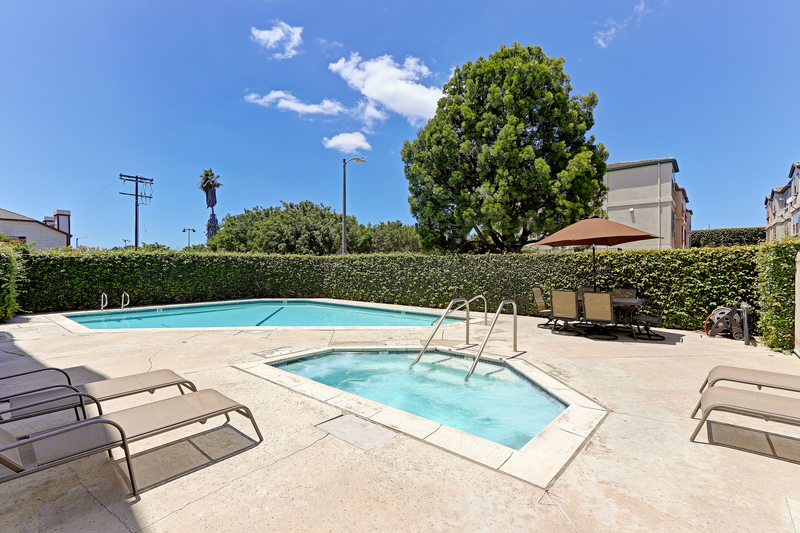 Located in a very desirable location - at the edge of Alamitos Beach and the East Village Arts District. With 894 square feet of living space this home features 2 nice sized bedrooms with good closet space and 1 bath with washer and dryer hook-ups. Large living room which is freshly painted in a soothing gray opens right up into the kitchen - which is perfect for entertaining. 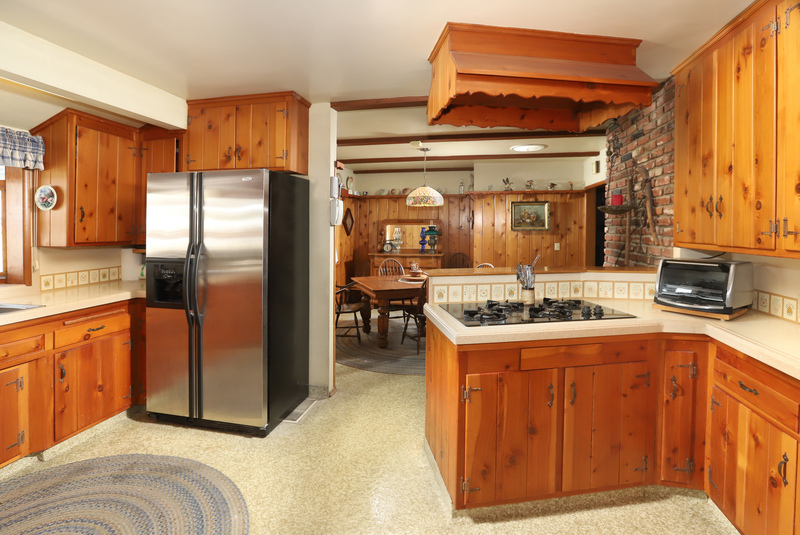 The kitchen - matches the charm of the mid-century building with newer General Electric Vintage inspired appliances - stove, refrigerator and microwave are included. 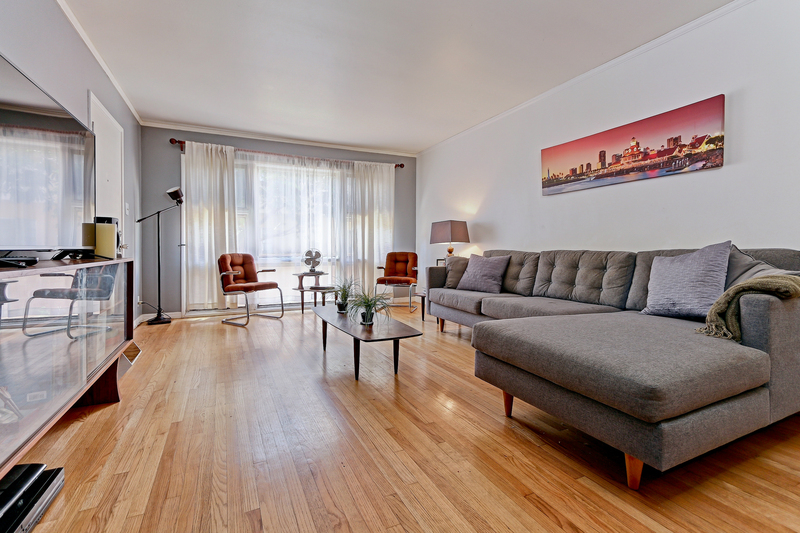 Gleaming original perfectly refinished hardwood floors and crown molding through out. Small well kept 11 unit building with low HOA fees of $159 a month. 1 block to the beach and great walkability to the Farmer's market, performing arts center, pike, retro row and restaurants. Prepared to be amazed by this state of the art, energy efficient home. With a fabulous split level floorplan, 4 bedrooms, 3 baths and 2,708 square feet of living space - this home is truly an entertainer's dream. Gourmet cook's kitchen with Quartz countertops, Carrera marble backsplash, custom cabinets, Bosch microwave and dishwasher, Thor 6 burner, grill and double oven stove, Samsung 4 drawer refrigerator and Quartz Island. Kitchen family room with direct access to deck. Living room/dining room combination with stunning French Oak floors, wine bar, Arctic split granite and see-through fireplace. Also there is a separate wet bar marrying the living room and kitchen together. Master suite with walk-in closet for her and separate closet for him. Master bath with separate vanities,rain shower and spa tub. Lower level features a huge game room (man cave), electric fireplace, wet bar with direct access to the backyard. With dual AC units, 2 heating zones controlled by NEST, vinyl windows, LED lighting, tankless water heater, RING doorbell, ECHO and USB outlets through-out the home. Perfect for savviest of buyer's. 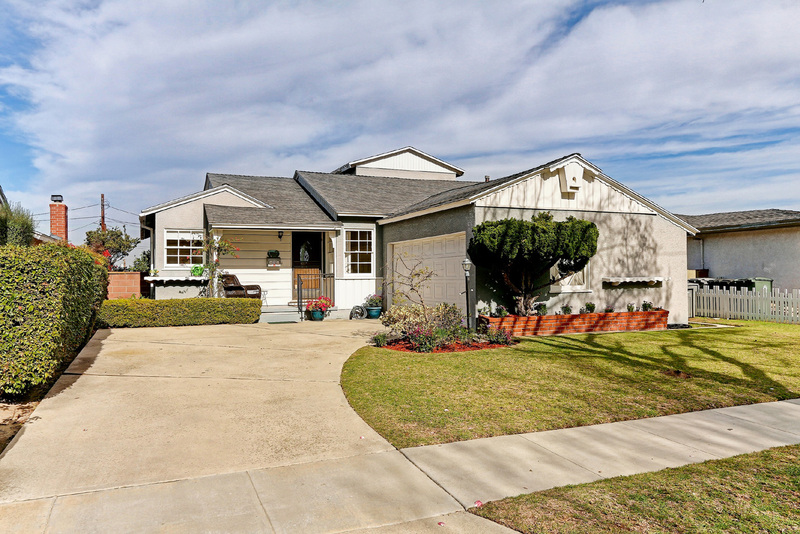 Just listed in Miraleste Pines, this 3 bedroom, 2 bath home is nestled at the top of a great street making it a uniquely charming turnkey winner. With 1,242 square feet of living space on a 7,414 flat lot, this home features a formal living room with lots of natural light and a gorgeous custom fireplace. 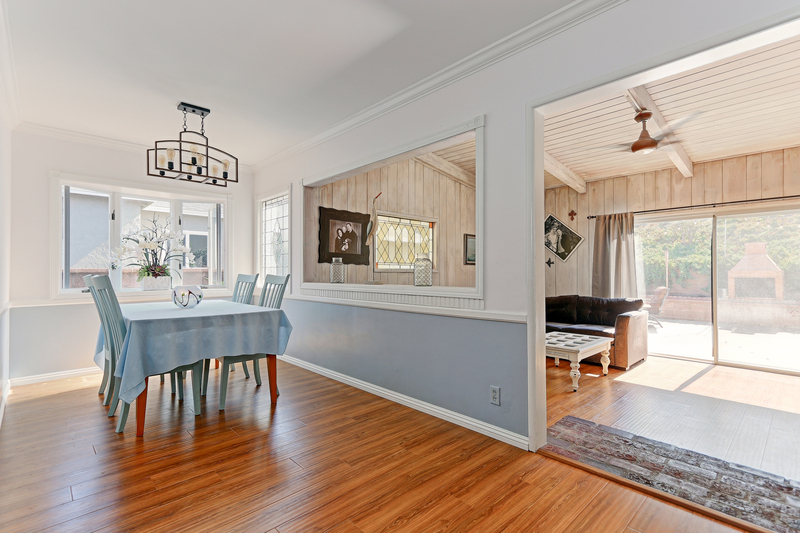 Gleaming hardwood floors travel from the living room into the dining room. All new vinyl windows and LED lighting throughout. 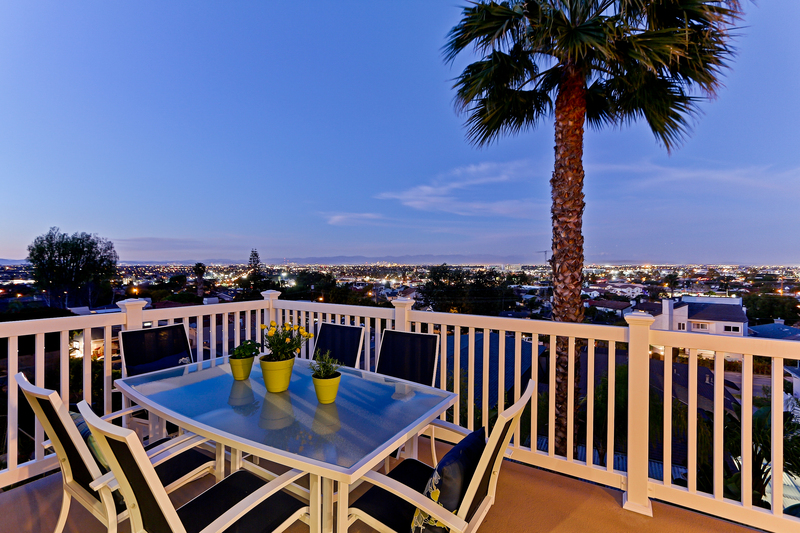 The private huge backyard is truly amazing with Peak-a-Boo harbor and city light views. Built-in bar-b-que with granite table top, bar and refrigerator. Newer 8 person hot tub and covered patio for entertaining year round. 2 car finished garage with lots of storage and additional parking perfect for a RV or boat. This turnkey home is light and bright with 3 bedrooms,3 baths, den and 1,564 square feet of living space on a 5,500 square foot lot. 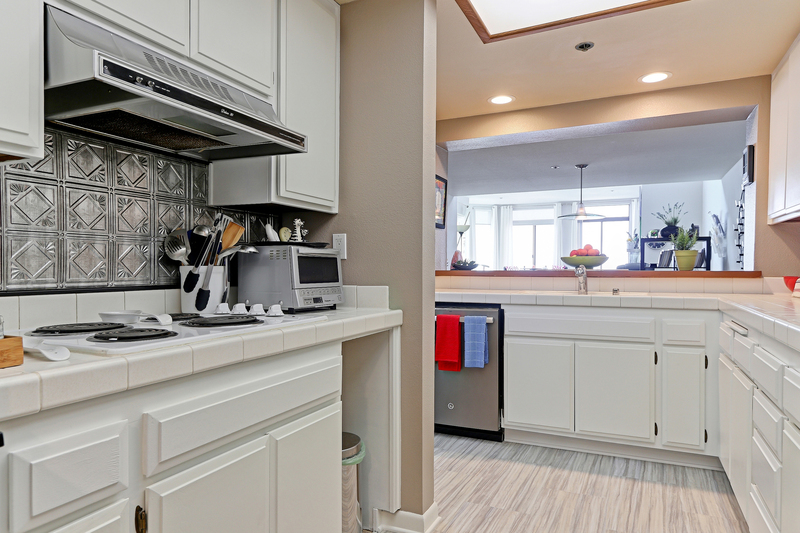 Open floor plan with remodeled kitchen that features custom cabinets, granite counters, new appliances, stainless back splash and slate floors. 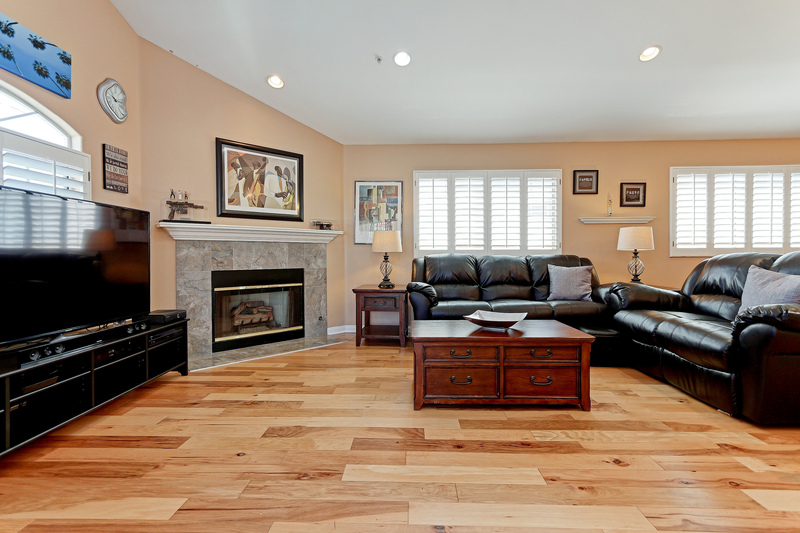 Hardwood floors and recessed lighting are throughout with a see-through fireplace in the living room and den. 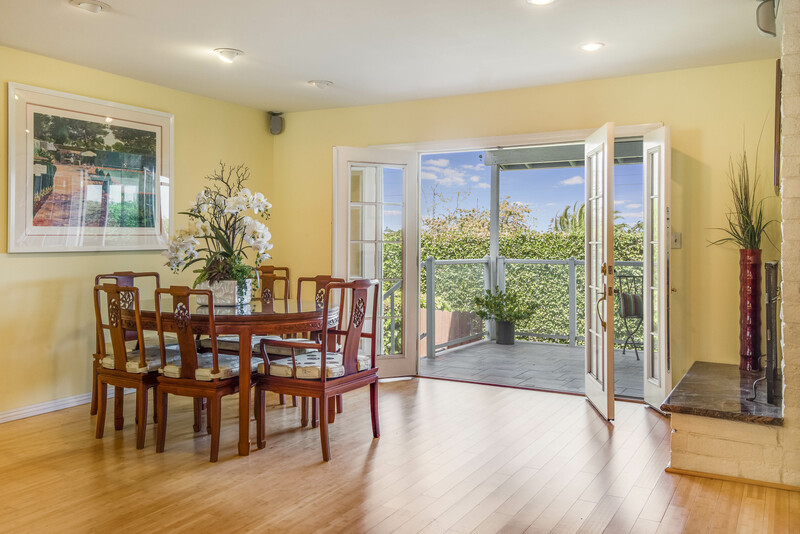 Milgard French doors open to a serene lushly landscaped private backyard. Best of the Torrance schools, Riviera elementary, Richardson middle and South High. Entertainer's delight, pool home featuring 6 bedrooms and 3 baths - 3,264 square feet of living space with 680 square foot finished attic. Gorgeous Cook's kitchen with granite, stainless appliances and center island that opens up to a picture perfect pool backyard with plenty of room to entertain. 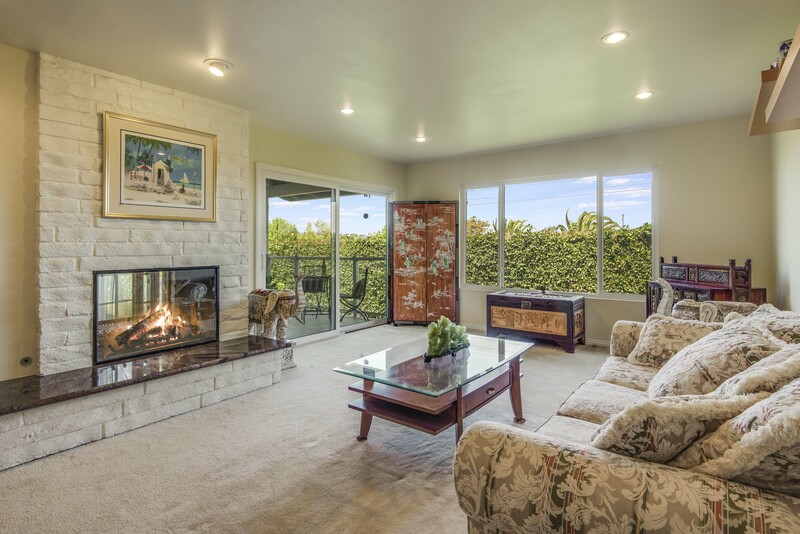 Spacious master suite with Palos Verdes view, wetbar, fireplace and walk-in closet. Luxurious master bath with spa tub and over sized shower. Formal living room and family room. 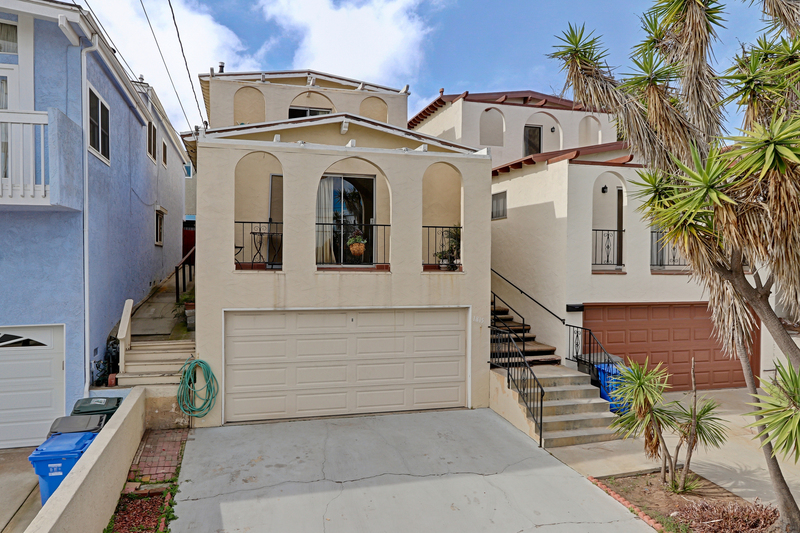 This home truly has it all - Walk to Seaside Elementary, Calle Mayor Middle and South High. 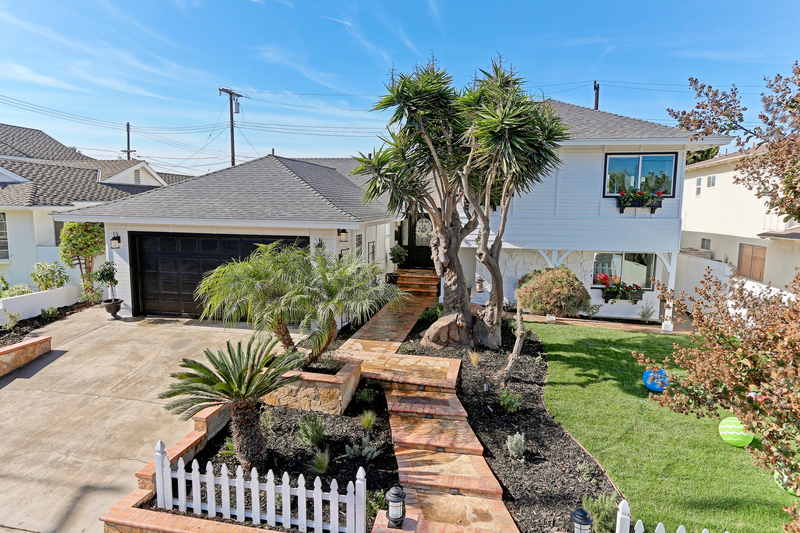 Just listed in the Palisades of San Pedro. 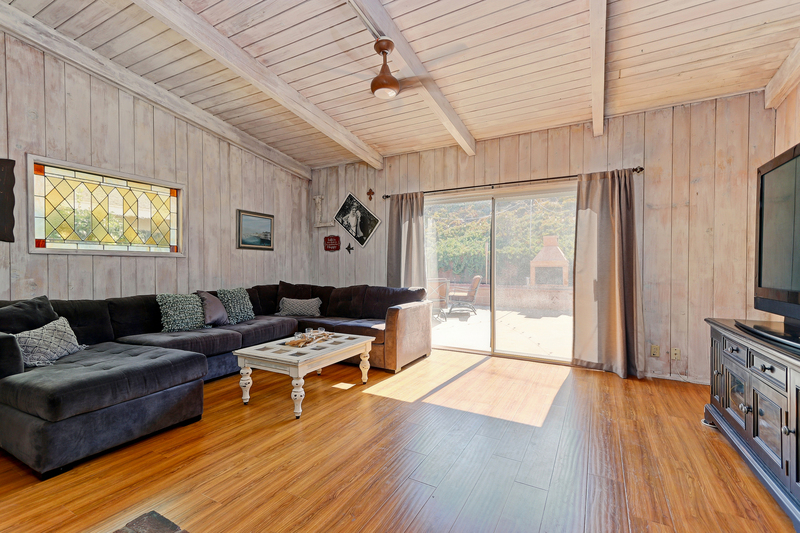 This adorable 3 bedroom 1.5 bath features 1,118 square feet of living space on an amazing 6,250 square foot lot. 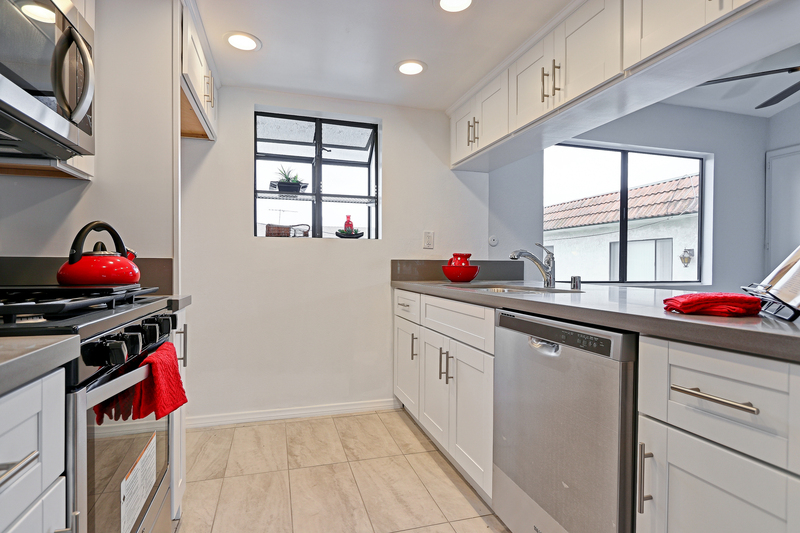 The eat-in kitchen features stainless appliances, custom cabinets and concrete counters. All 3 bedrooms are nice size with good closet space. 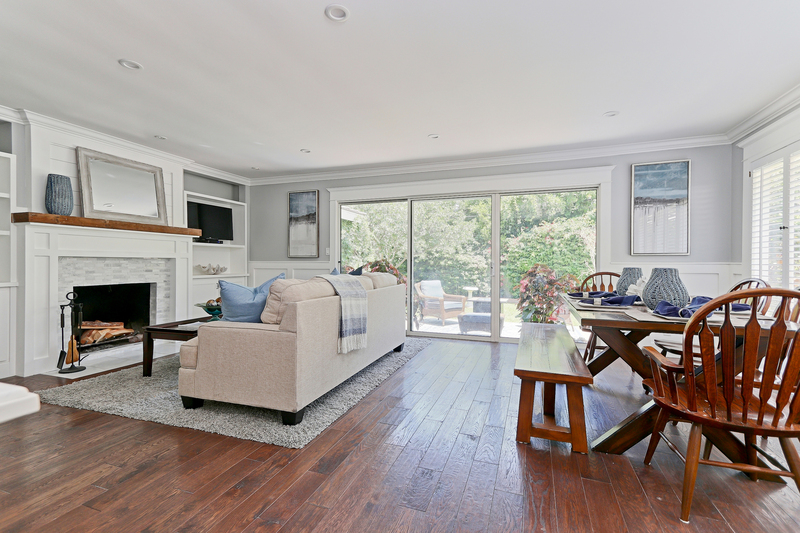 Gorgeous hardwood floors through-out. 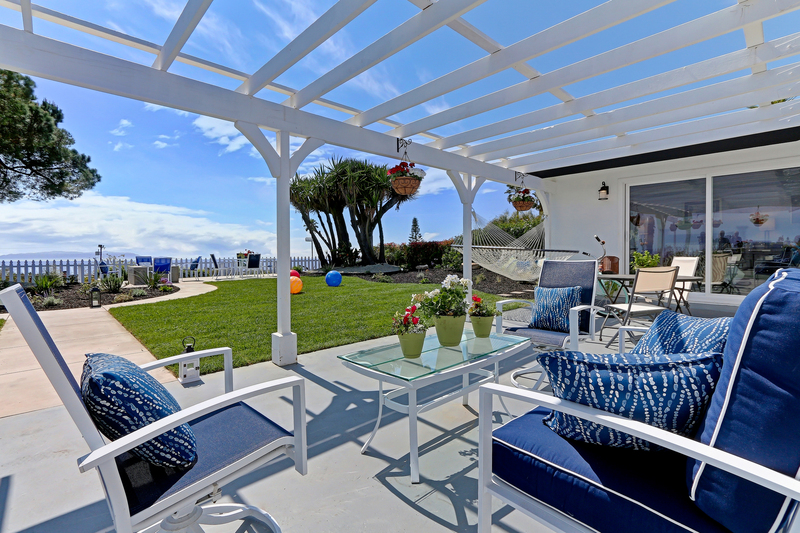 The backyard is truly an entertainer's delight. Very private and serene with 2 levels - Top level features an amazing built-in bar-b-que with refrigerator, deck and firepit with built-in seating. Lower level is perfect for a play area. 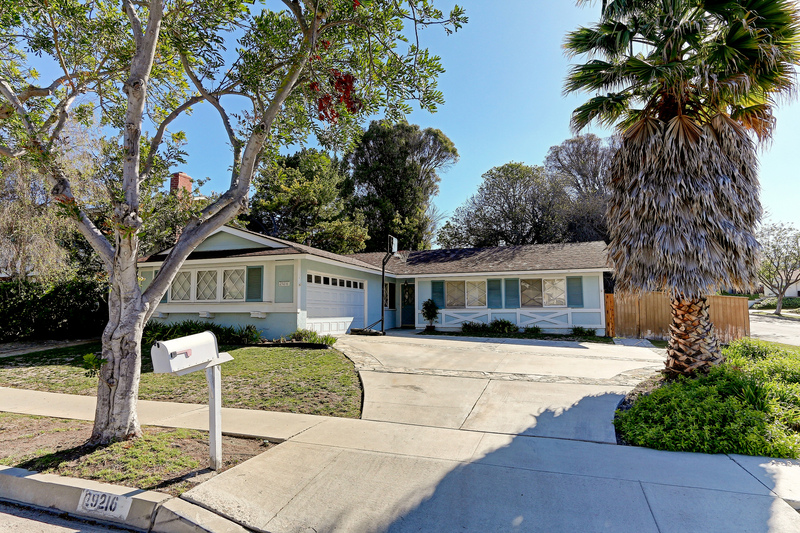 What a perfect starter home and a great opportunity to gt into this popular South Torrance neighborhood. With 2 large bedrooms , 1 3/4 baths and 1,140 square feet of living space. 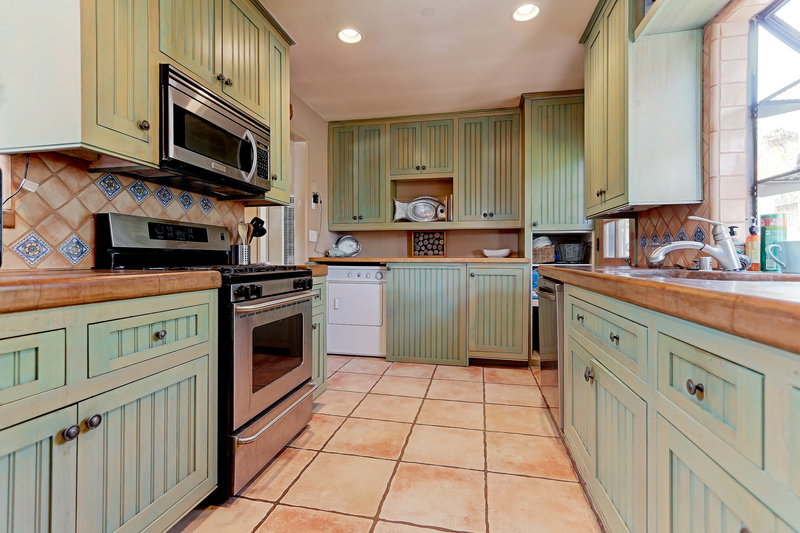 This home features a spacious eat-in kitchen with new flooring. Fresh paint and hardwood floors through-out. Quiet serene tiered backyard for entertaining. 1 car garage with direct access. Lot size is 5,392. Walk to parks, restaurants and shopping. 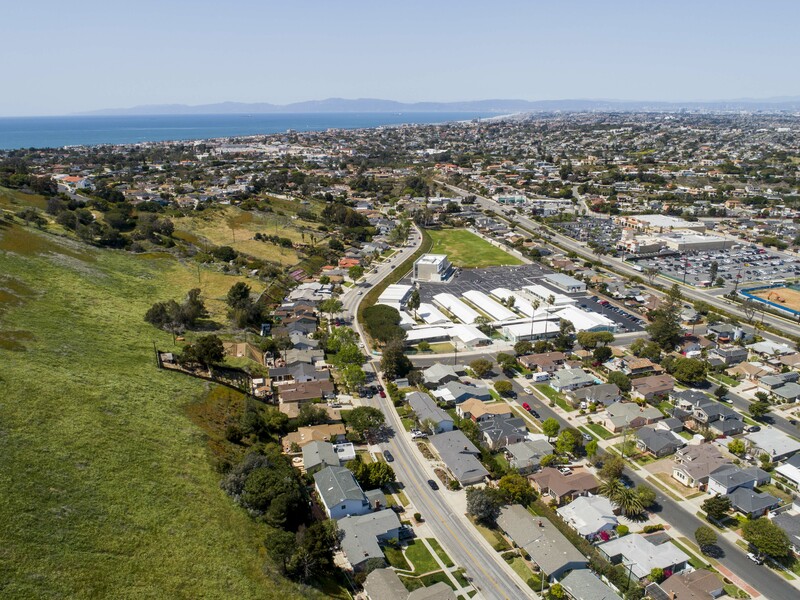 Award winning Torrance schools, Walteria elementary, Richardson Middle and South High.
" 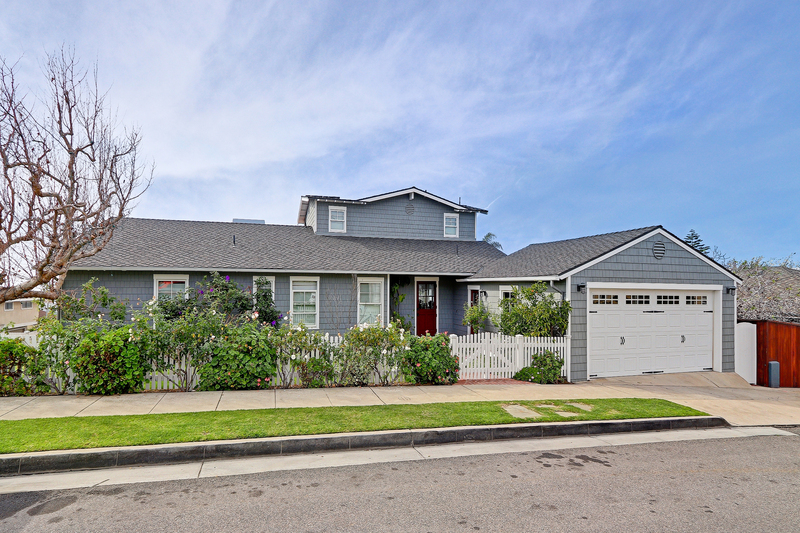 Welcome to the Hamptons in South Torrance"
Prepare to be amazed by this " state of the art home". With 4 bedrooms and 3 full baths and 2,047 square feet of living space - this home is truly 1 of a kind. The great room showcases the kitchen, dining and living area. The Kitchen is a gourmet chef's dream. With Quartz counter tops,Carrera marble back splash, custom hinge closing cabinets, Bosch microwave and dishwasher, Thor 6 burner, grill and double oven stove and a Samsung 4 drawer refrigerator. 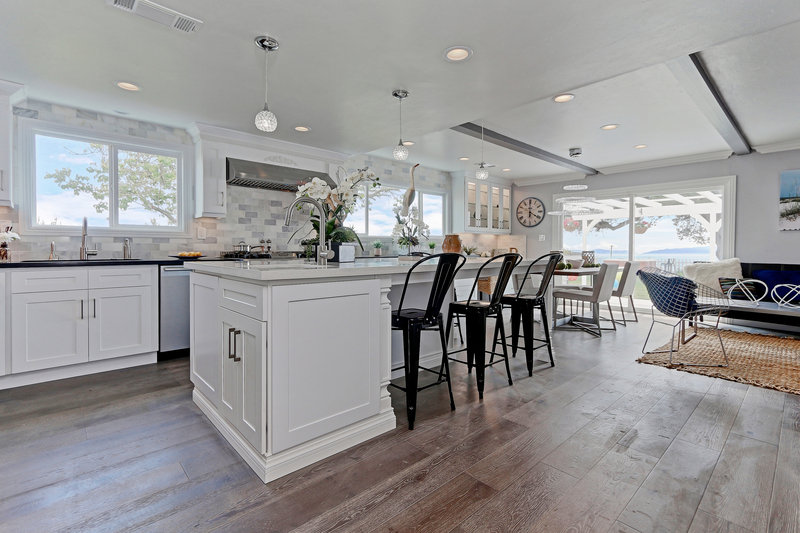 An oversize Island with vegetable sink and built-in microwave and separate kitchen bar with dual temperature wine refrigerator completes this magnificent heart of the home. The great room also features a gas fireplace with split Arctic granite floor to ceiling hearth, stunning engineered hardwood floors, vinyl dual pane windows and LED recessed lighting through-out. There is a separate family room featuring an electric heating fireplace and follow the stairs up to a 14 x 8 foot loft - which would be perfect for an office or a kids playroom. Master suite is separate from the other 3 bedrooms with his and her closets and spacious master bath with 2 separate vanities, marble floor, custom shower and separate tub. One of the other 3 bedrooms also has it's own full bath. Separate laundry room with Samsung digital washer/dryer. Finished garage with epoxy flooring and electric car charging station. 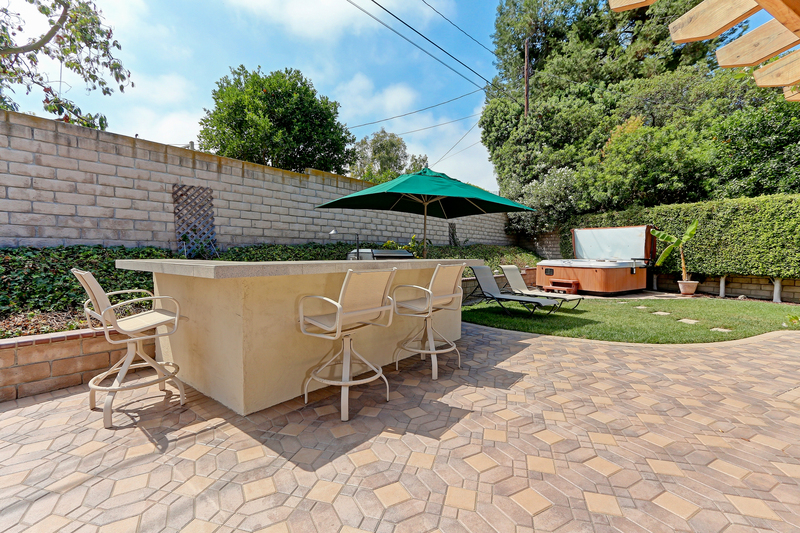 Private backyard perfect for entertaining with grass and separate BBQ and patio area. Brand new roof, brand new forced air heat and air conditioning, updated electrical and copper plumbing. 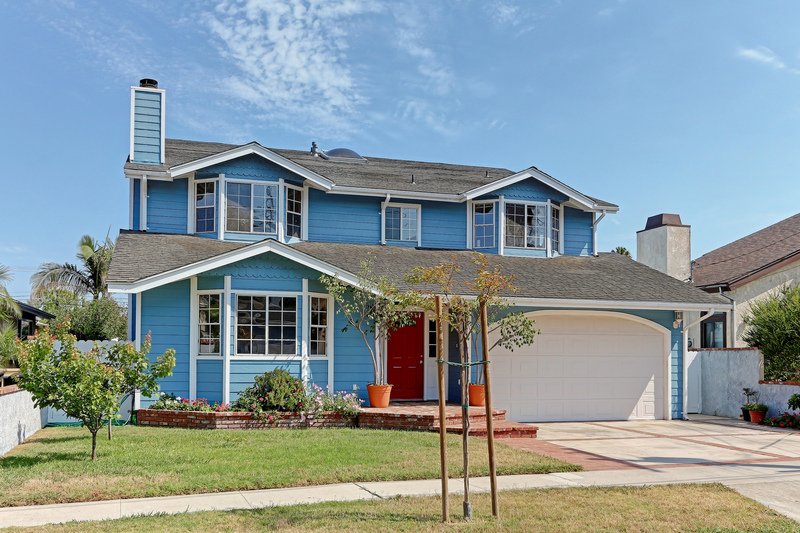 Walk to award winning Torrance schools. For the TECH-SAVY buyer - mobile control with the NEST, Doorbot and LED lighting in every room. 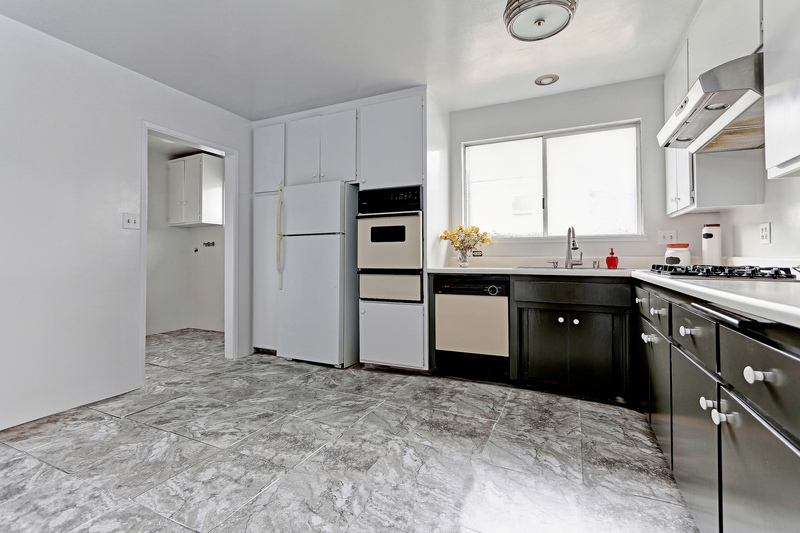 2 bedrooms and 2 baths with 910 square feet of living space. 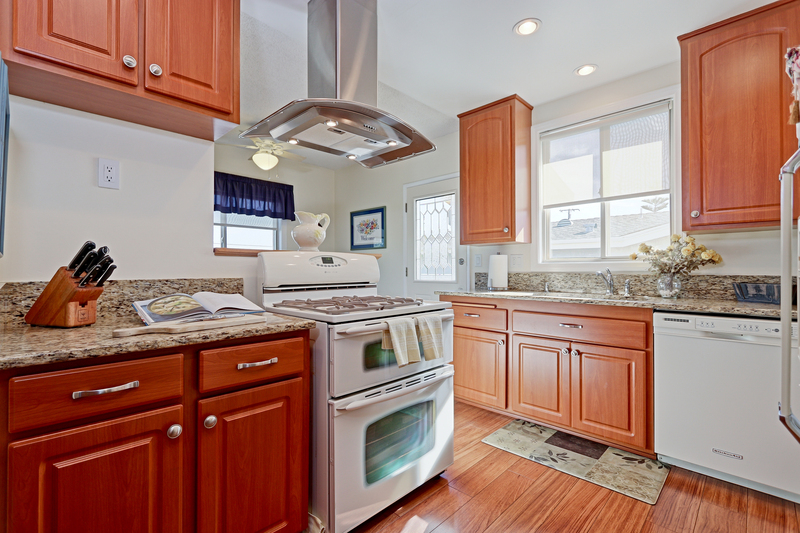 Gorgeous kitchen with recessed lighting, maple cabinets, stainless appliances, granite counter tops and island. Dining area/ Living room open up to the kitchen with balcony off the living area. Stunning walnut hardwood floors. Nice master suite with walk-in closet and master bath with travertine and tile. This is a secured complex with a resort style pool and BBQ area, community room and kitchen for entertaining. 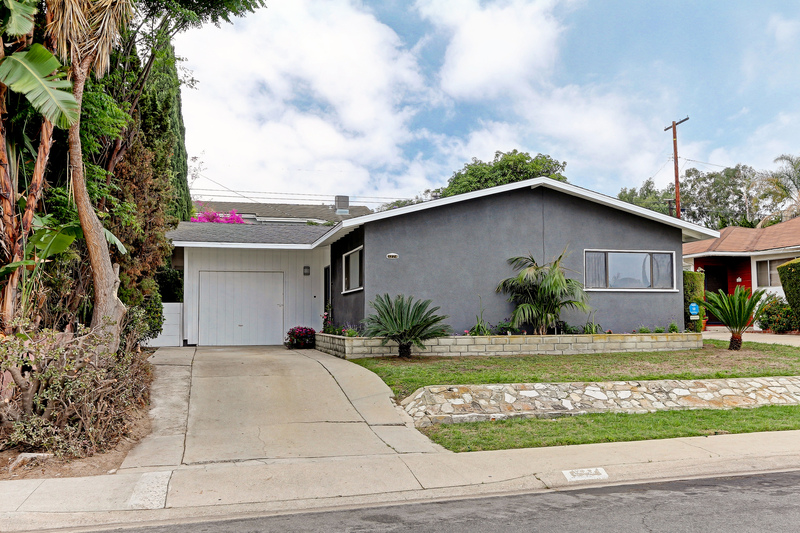 OPPORTUNITY KNOCKS - Make this your dream home with cosmetic updates in this great Los Verdes neighborhood. With a wonderful floor plan, this corner home has 1,619 square feet of living space on a flat usable 9,004 square foot lot. Featuring 4 bedrooms and 2 baths. The kitchen opens up to a spacious dining room. Large living room with fireplace that opens to the huge flat private back yard. Forced air heat and copper plumbing through-out. 2 car attached garage with direct access. Great schools - Vista Grande Elementary, Ridgecrest Middle, and choice of PV or Peninsula High. Flooded with natural light - this home shows like a model. 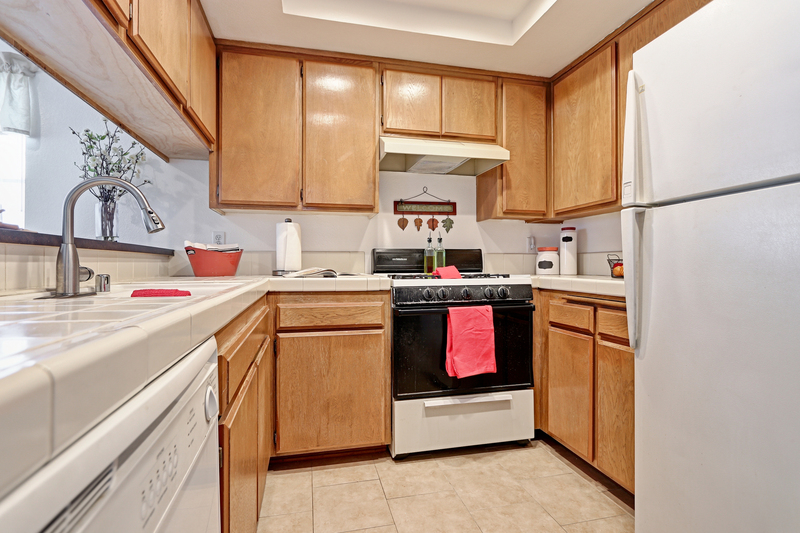 Spacious Chef's kitchen with refinished cabinets and granite counter tops. Huge master suite with vaulted ceilings and walk-in closet. Luxurious master bath with separate spa tub, dual sinks and marble shower, floors and counters. 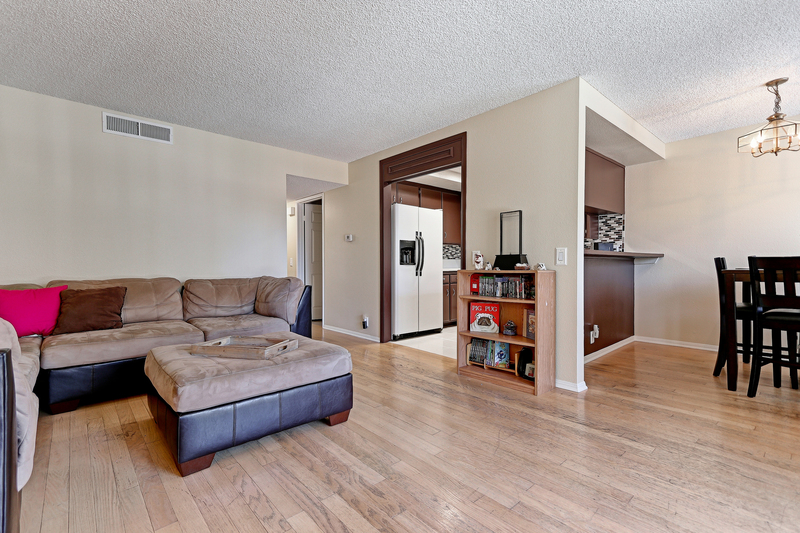 Open living area with vaulted ceilings, window shutters and stunning Birch hardwood floors through-out. 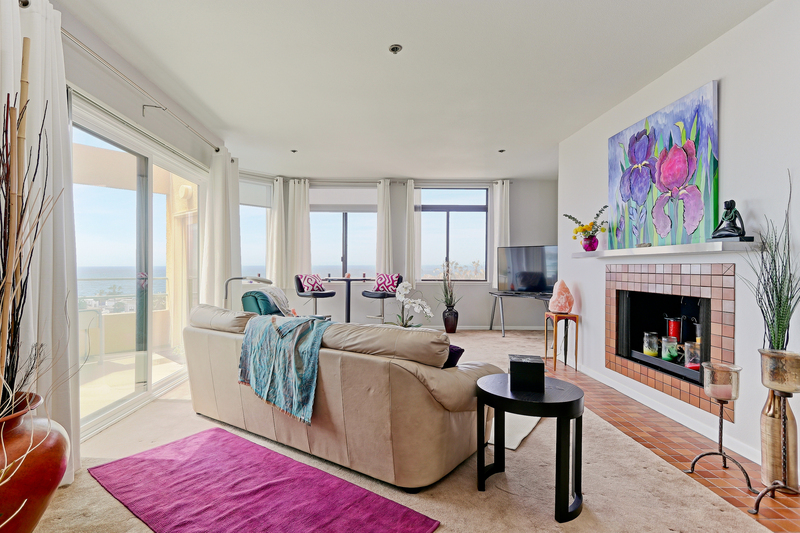 Both the master suite and living area open up to a large private deck with city light views - perfect for entertaining. Both downstairs bedrooms are a good size. Fresh paint through out. 2 car attached garage with direct access. 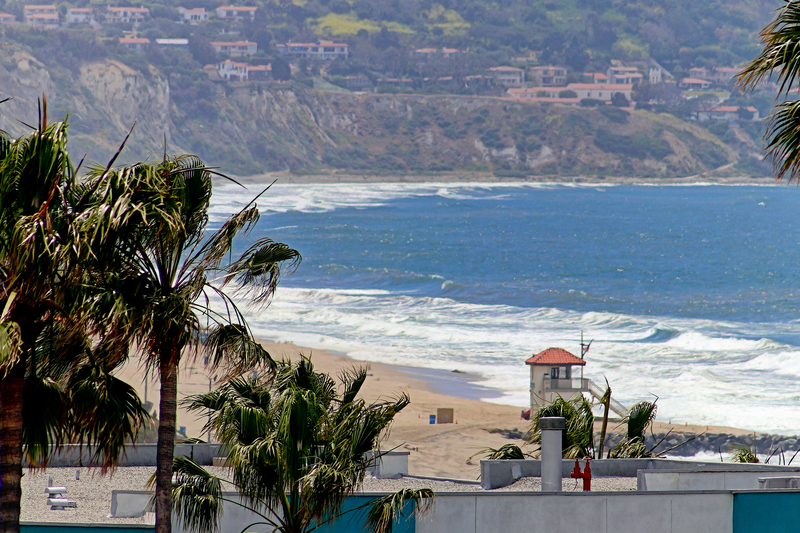 Close to beaches, shopping and freeways. Low HOA. Location, location, location. Located on a tree lined street in the upper Riviera. 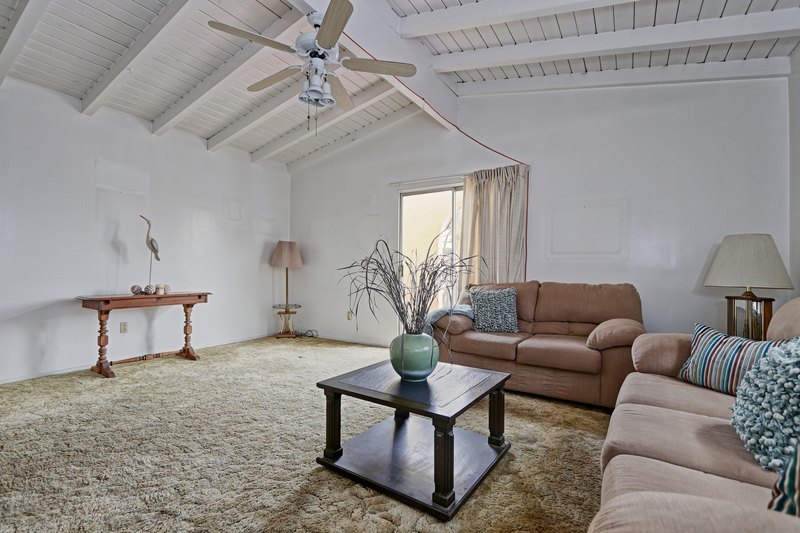 This home is light and bright featuring 3 bedrooms, 1 bath with 1,378 square feet of living space on a 50x115 lot. The full bath is nicely updated with skylight. 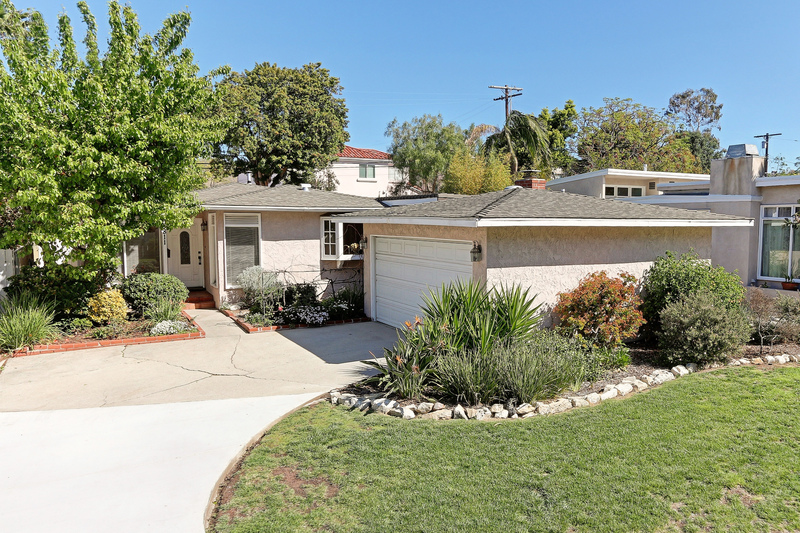 Spacious kitchen with oak cabinets, custom tile counters and garden window opens up to a nice family room with cozy Palos Verdes stone fireplace. Hardwood floors through out. Attached 2 car garage. There is an additional sun room that is not in the square footage. Wonderful private serene and tranquil backyard. This home is not in the hillside overlay (buyer to verify). Award winning schools, Riviera Elementary, Richardson Middle and South High. With expansion potential - the opportunities are truly endless. Flooded with natural light - this home has spectacular mountain and city views. Great opportunity - With 4 bedrooms and 2.5 baths - this lovingly maintained home features 1,886 square feet of living space on a 6,600 square foot lot. Huge master suite upstairs with 3/4 bath and vaulted ceilings. All 3 other bedrooms downstairs are good size. 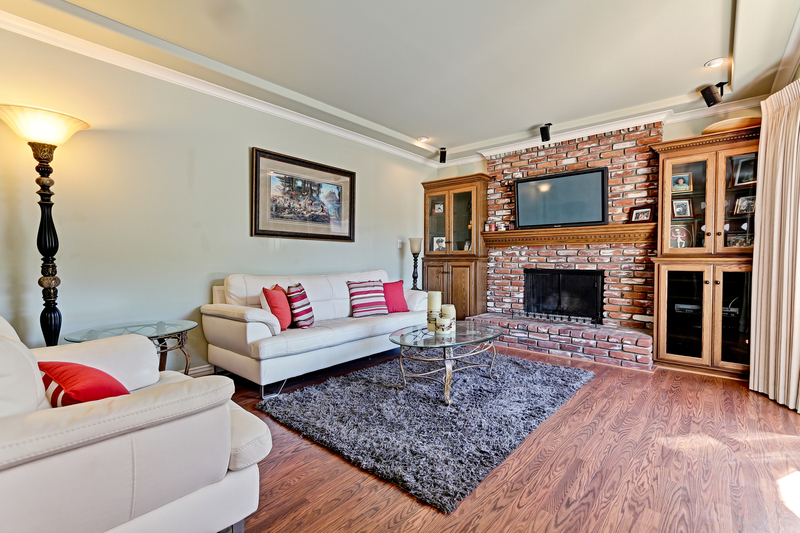 Cozy family room with brick fireplace. Spacious flat grassy backyard for the kids to play in. Copper plumbing, forced air heat, fresh paint and new carpet. 2 car attached garage with direct access. Laundry in garage. Award winning Torrance schools- Riviera Elementary, Richardson Middle and South High.